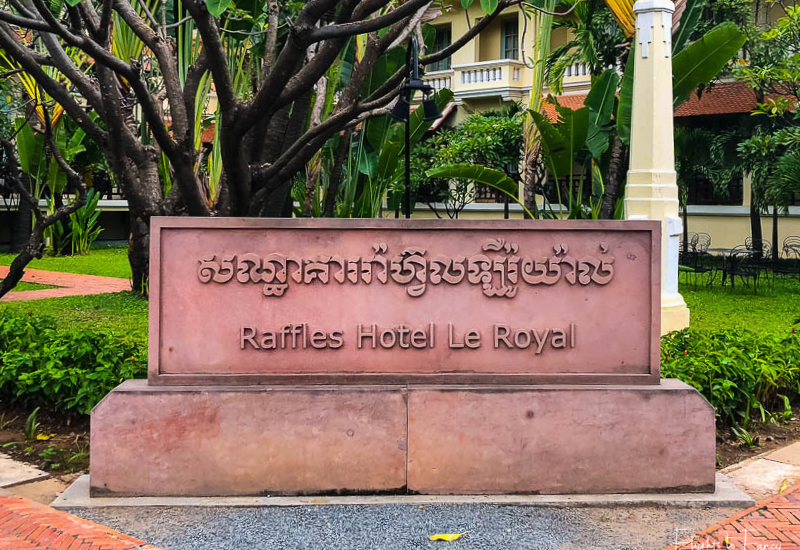 We flew into Phnom Penh on Bassaka Air from Siem Reap, jumped into our pre-booked Klook transfer, battled the Phnom Penh traffic for an hour and arrived at Raffles Hotel Le Royal at around 1pm. The minute we ascended the red carpet clad stairs and stepped through the pastel double doors we felt the weight of almost 100 years of history envelop us. Raffles Hotel Le Royal Phnom Penh stated life as Hotel Le Royal in 1929. 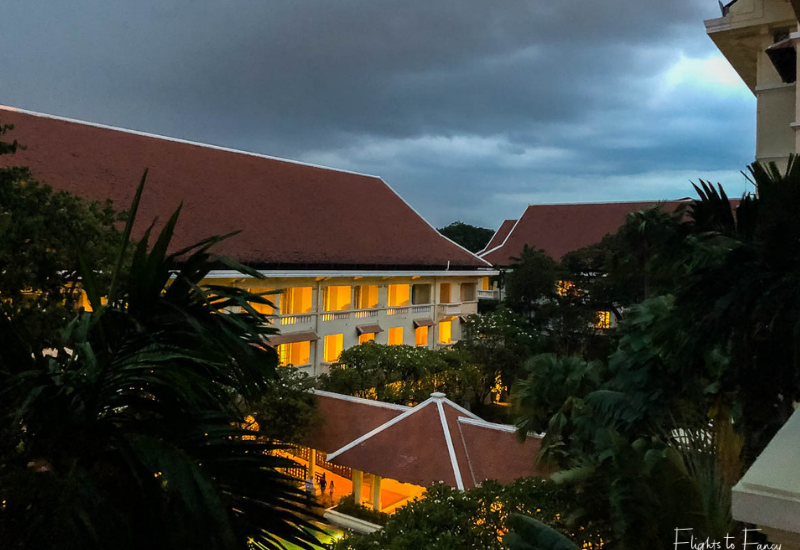 The name reflects the close connection that this grand luxury hotel in Phnom Penh has to the Cambodian royal family. 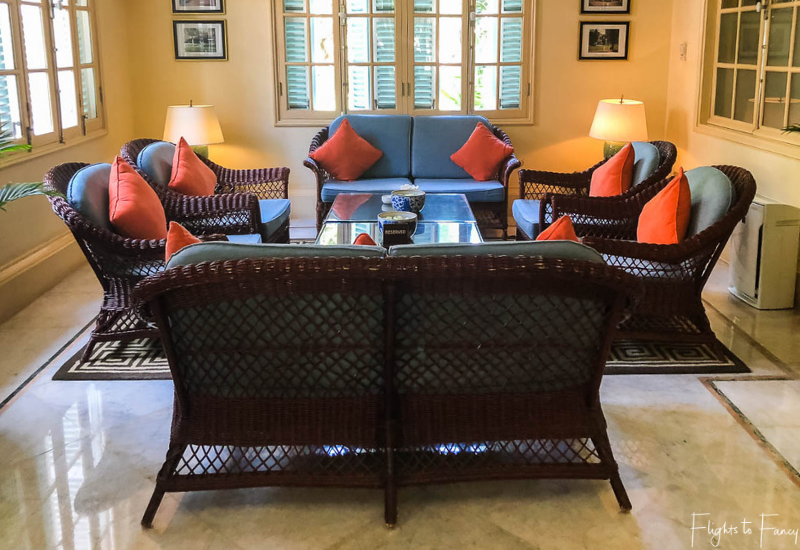 Blessed with a prestigious address in the best area to stay in Phnom Penh, many a famous guest occupied her opulent rooms in the 1950’s and 1960’s including Charlie Chaplin, W Somerset Maugham and Jacqueline Kennedy. 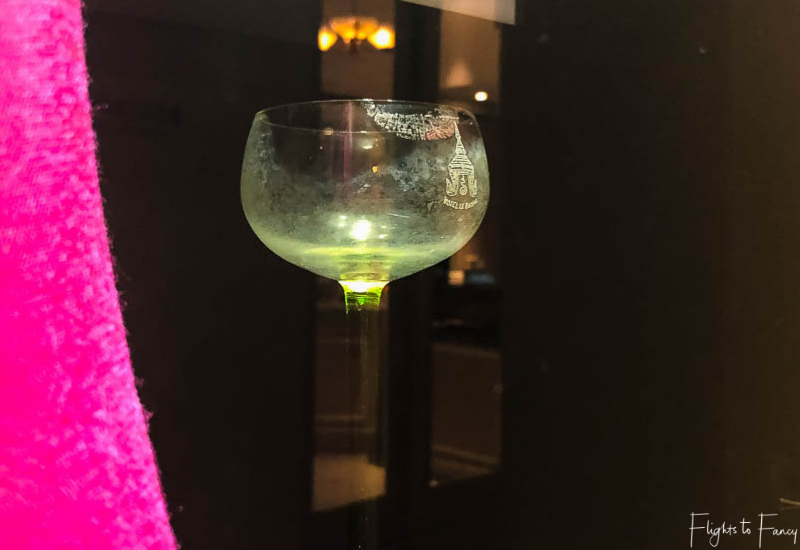 Jacqui’s lipstick smeared cocktail glass is still proudly on display in the hotel to this day. 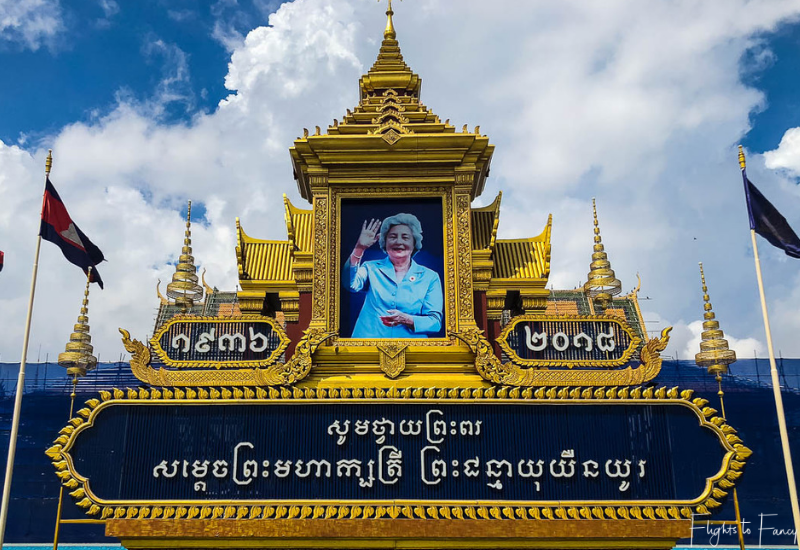 In 1970 the name changed to Hotel Le Phnom and she continued to welcome guests until April 1975 when Phnom Penh fell to the brutal Khmer Rouge regime. 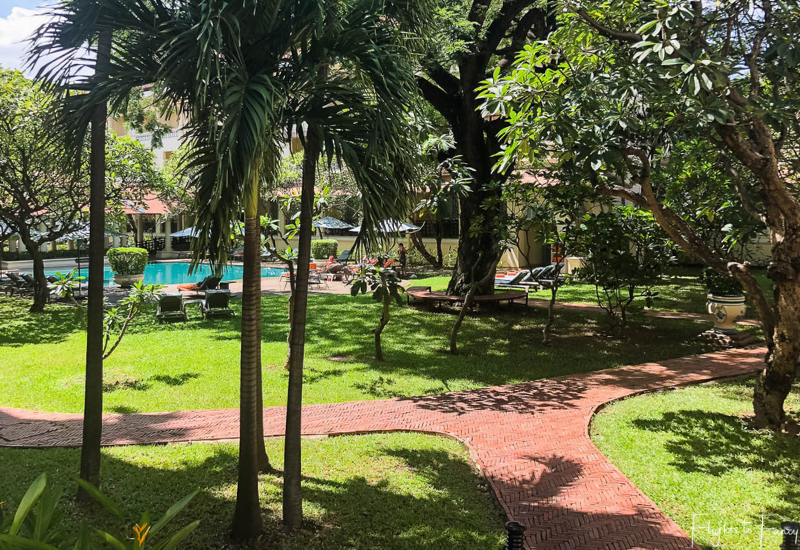 During those first few harrowing days under the Khmer Rouge, Hotel Le Phnom was declared a neutral zone and the French Colonial façade was decorated with giant white flags and prominent red crosses while the borders were reinforced with barbed wire barricades. The last remaining occupants were eventually forced to evacuate and many foreigners sought refuge in the French Embassy before ultimately fleeing over the Thai border. 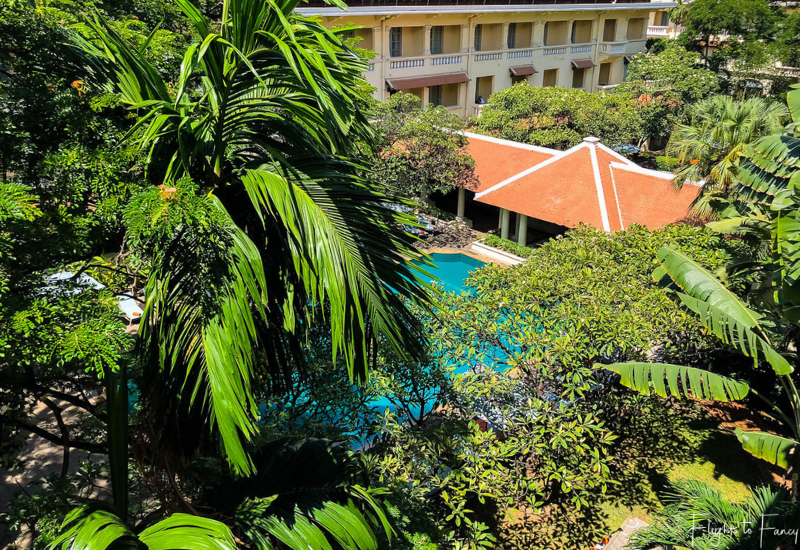 The hotel was occupied by the Khmer Rouge between 1975 – 1979 before reopening in 1979 as Hotel Samaki which predominantly housed international aid agencies who provided assistance in the post war years. In 1993 the name reverted back to Hotel Le Royal and in 1995 Raffles Hotels stepped in. 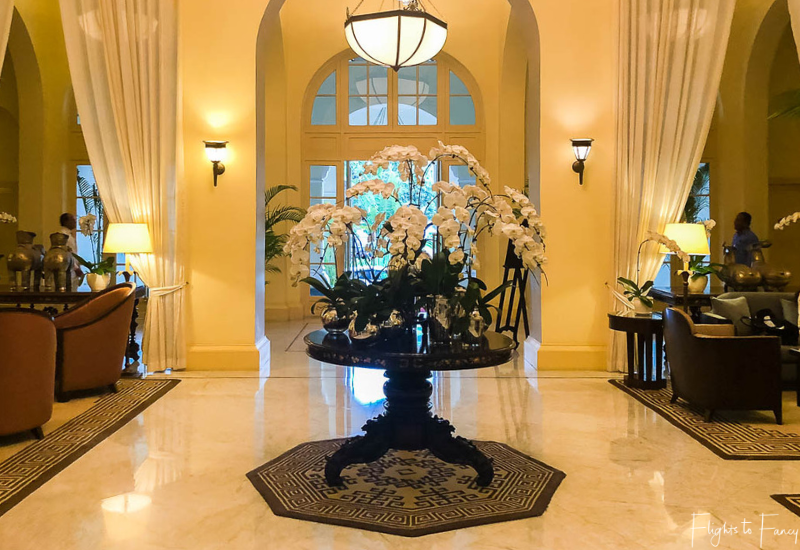 They demolished bungalows, meticulously restored the original building to its former glory and added a number of additional wings before the grand re-opening of Raffles Hotel Le Royal in 1997. 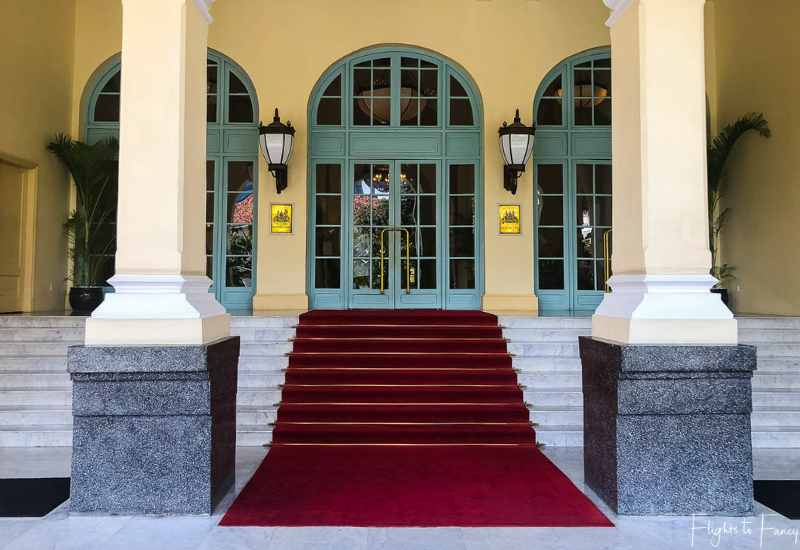 Since then, Raffles Hotel Phnom Penh has gone from strength to strength and is now considered the city’s premiere luxury hotel. And it’s not hard to see why. 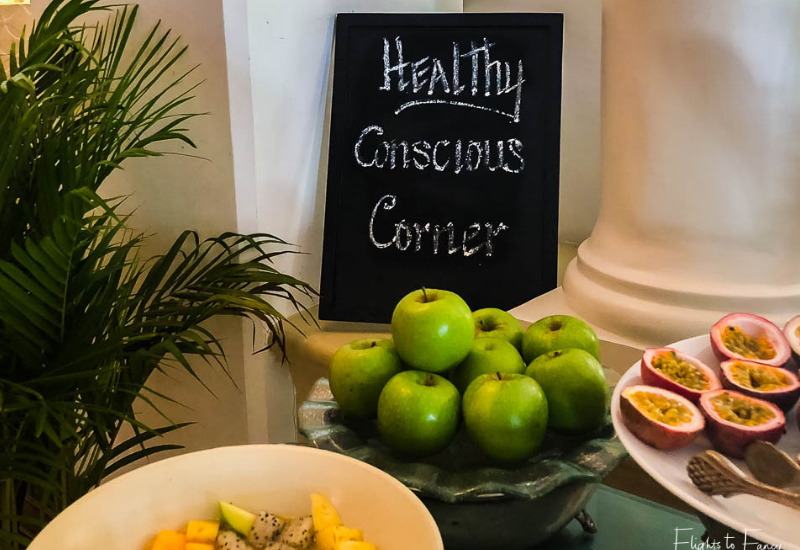 Any hotel can offer guests a fancy room, but it’s the details that make a stay truly memorable and Raffles Hotels nail it every time. The grand entrance of Raffles Hotel Le Royal is flanked by immaculately turned out doormen 24 hours a day who welcome and farewell guests warmly, complimentary drinks are proffered to all new arrivals on check in, the lush tropical gardens are perfect for relaxing and the uncluttered lemongrass scented walkways offer a refreshingly cool respite from the oppressive Phnom Penh heat. But the jewel in the Raffles crown is undeniably its people. It’s obvious they make it their mission to ensure every guest feels special. 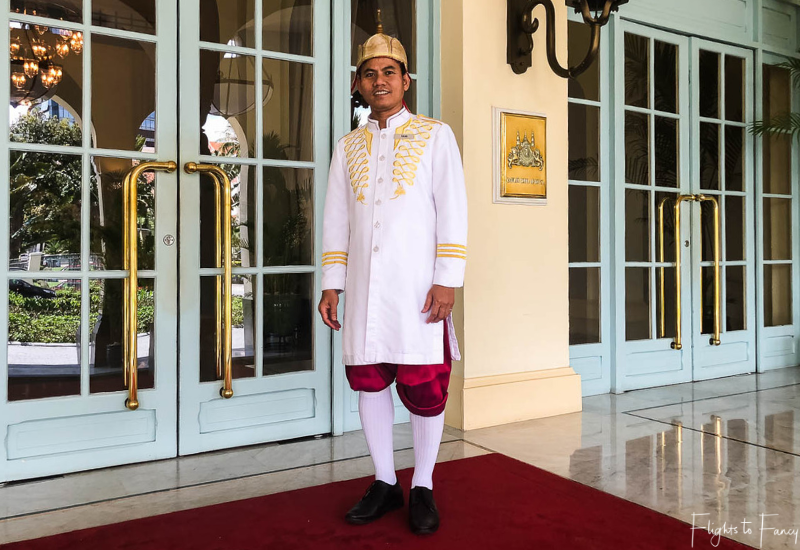 Sokha, the smiling doorman, greeted us daily by name, a resourceful concierge managed to track me down a couple of batteries when my mouse ran out of juice, attentive service staff take pains not to mar the elegant corridors with their cumbersome trolleys and our butler was always on hand if needed. 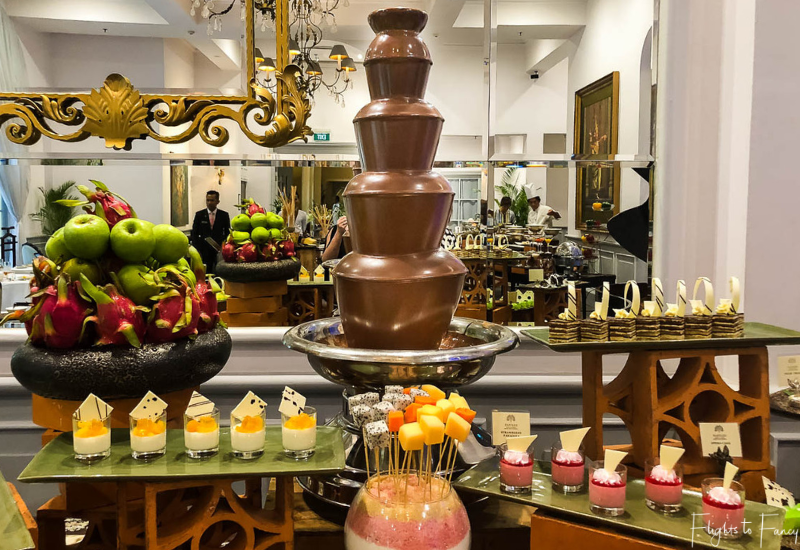 A stay at Raffles Hotel Le Royal really is like stepping back to a gentler time. 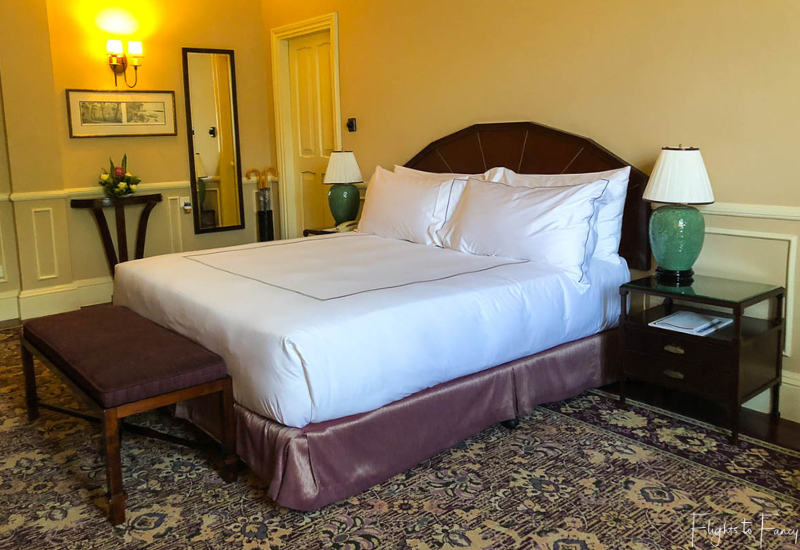 Raffles Hotel Le Royal offers a variety of luxury rooms and suites to appeal to discerning travelers from around the globe. 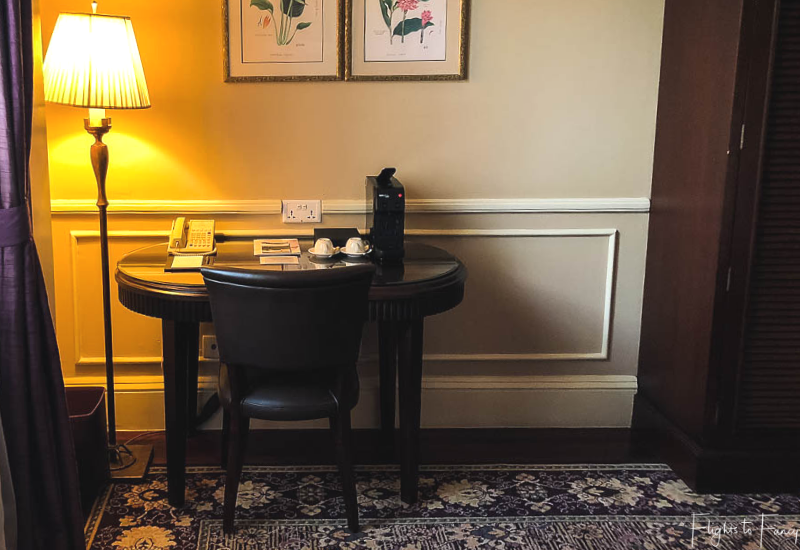 We were assigned room 303 in the original building which had been tastefully modernised without diluting any of the original old world charm. Our stateroom was spacious and featured impossibly high ceilings, a king sized bed, a large screen TV, a desk and a small sitting area. The dark wooden floors were softened with a huge intricate rug and I loved the fresh flowers throughout. Off the bedroom, double doors open to a narrow juliette balcony with a view over the pools and gardens. I’m told the tree I could almost reach is over a hundred years old. 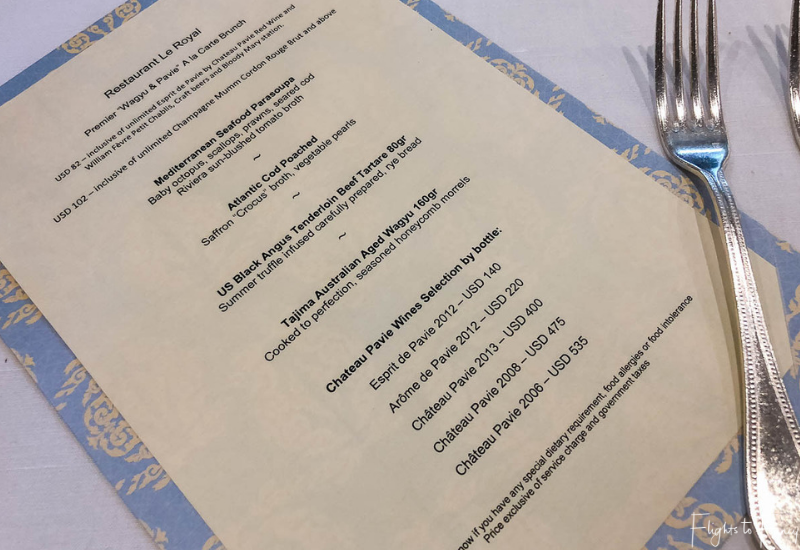 We had been in Cambodia for three days when we arrived in Phnom Penh but we still hadn’t quite adjusted to the three-hour time difference from Sydney. 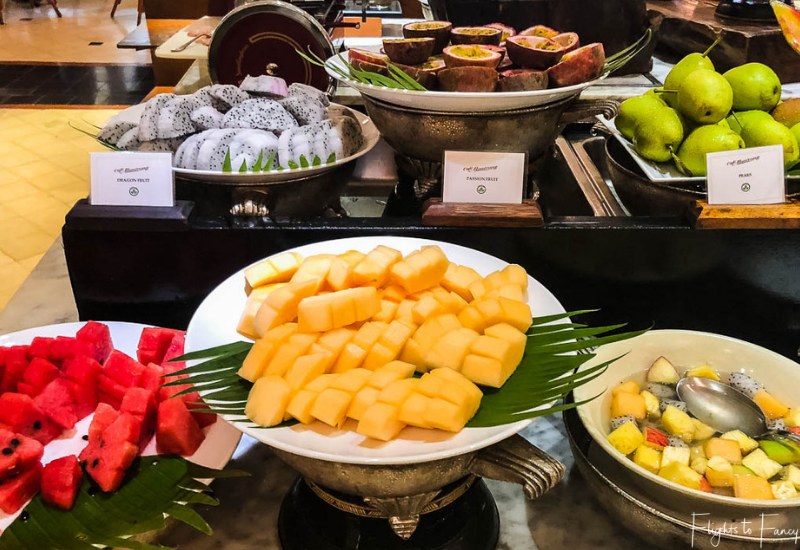 The annoying side effect was that we found ourselves wide awake at 4am, but thankfully that all changed when we checked into Raffles Hotel Le Royal. The comfy bed and black out curtains well and truly put paid to our unwelcome early morning walk up calls and we were truly grateful for the sleep in. Old buildings tend to have their quirks and our bathroom was no exception. 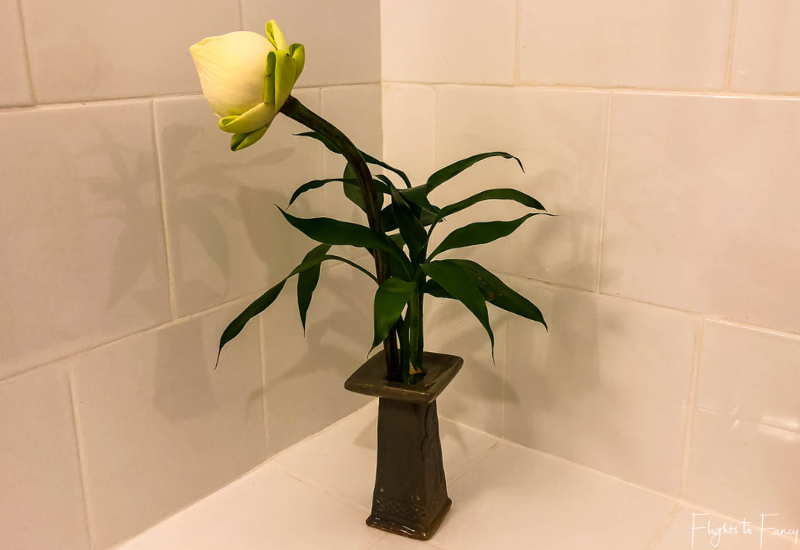 I got the hang of holding the toilet flush button in pretty quickly but I never really worked out how to adjust the temperature and flow in the shower. Afternoon thunderstorms in Phnom Penh are common and the umbrellas in the room came in handy more than once to fight off a deluge. The generous courtyard which separates the old and the new wings is dominated by two outdoor pools. 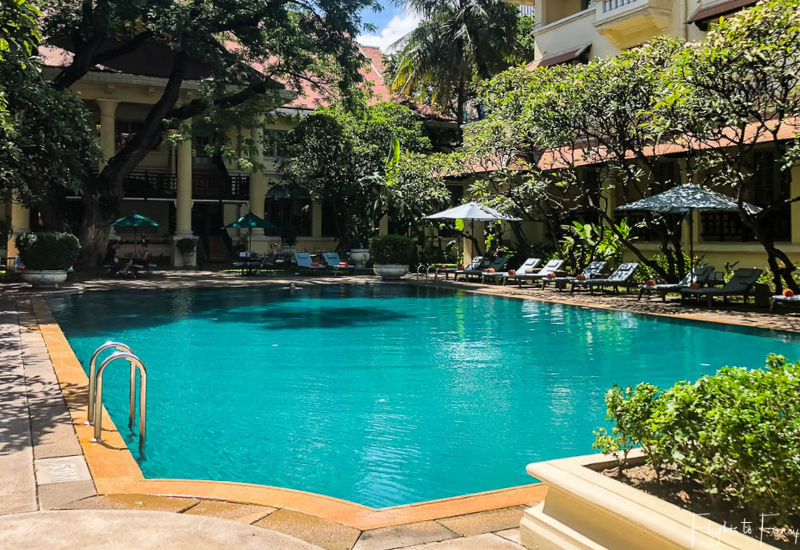 We chose to spend one morning lazing beside the lap pool after our disastrous attempt to visit the Royal Palace was cut short. 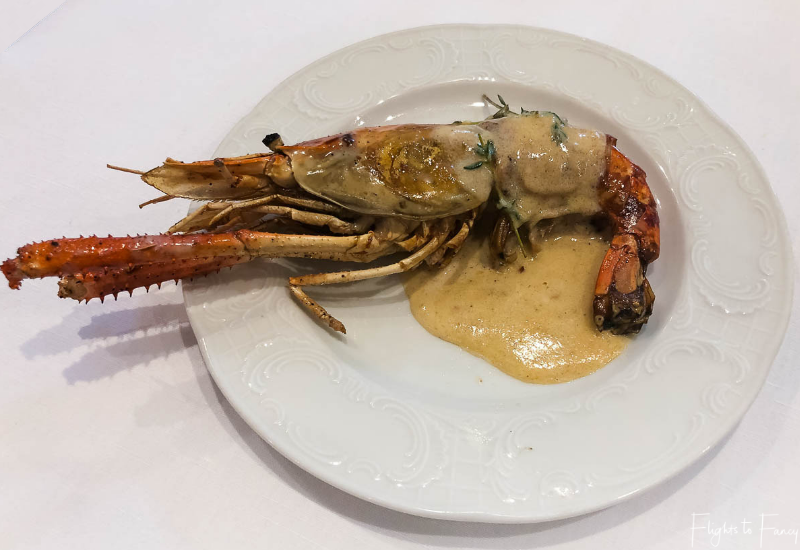 It was just what the doctor ordered to calm our frazzled nerves. 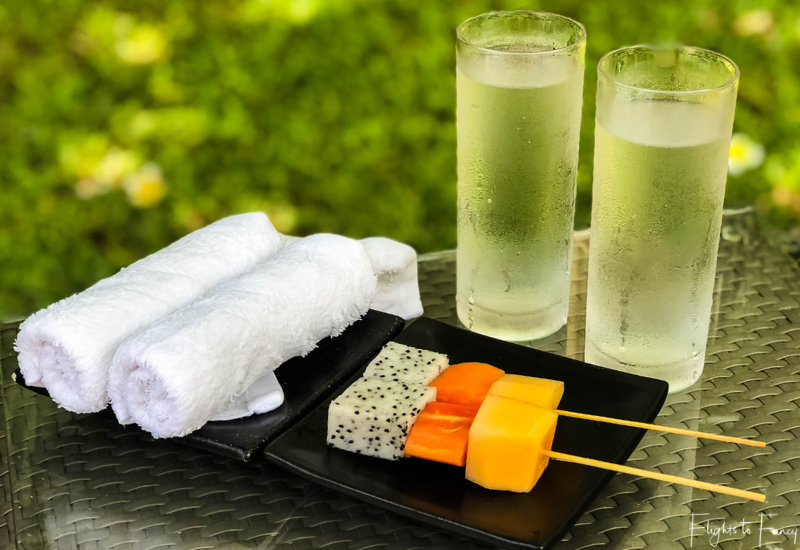 As we settled into the comfy sun lounges and the pool attendant appeared with chilled lemon infused water, fruit kebabs and cold towels we felt our worries slip away. The water temperature in the large pool was absolutely superb. Not too hot, but not so cool as to almost stop your heart when diving in. It was hard to tear ourselves away. 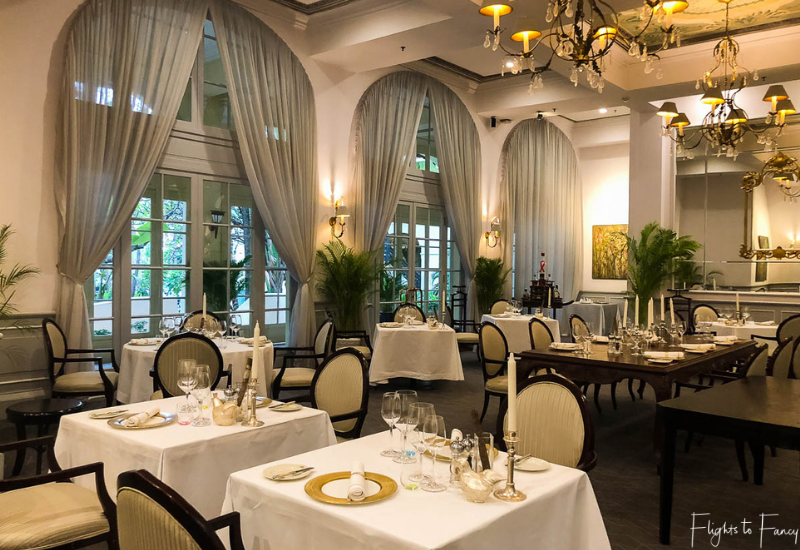 The absolute highlight of our stay at Raffles was the weekend Wagyu and Pavie brunch served in the prestigious Raffles Hotel restaurant, Restaurant Le Royal. 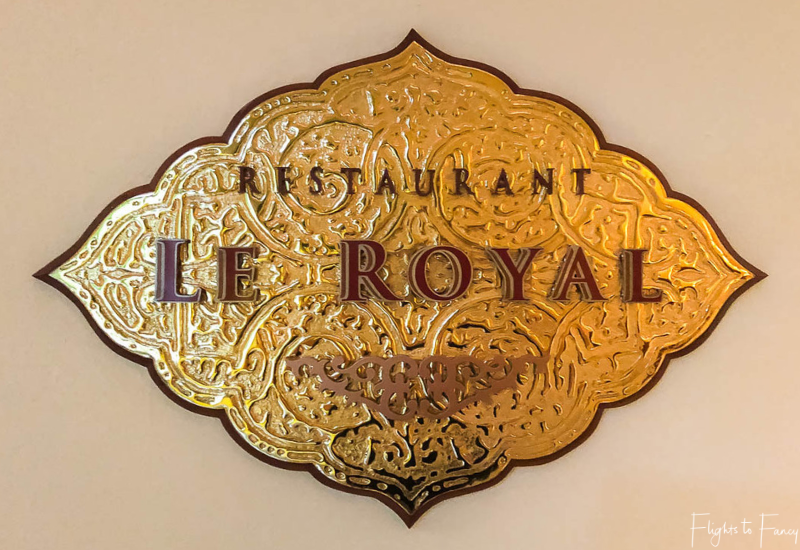 Raffles Hotel Restaurant Le Royal is the only restaurant in Phnom Penh with the royal seal of approval and is without doubt one of the most elegant eateries I have ever had the pleasure of dining in. 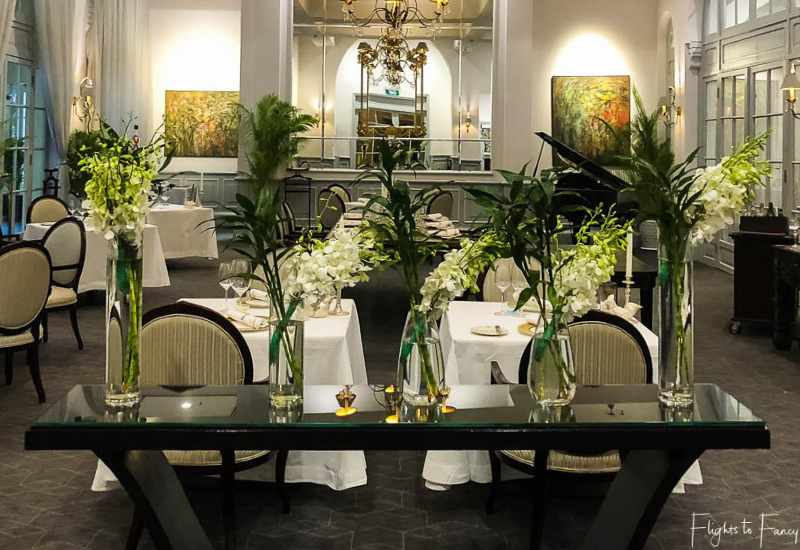 High ceilings adorned with art works completed by the royal painters, an abundance of fresh white flowers, linen embroidered with the royal crest and gold embellished tableware all set the scene. 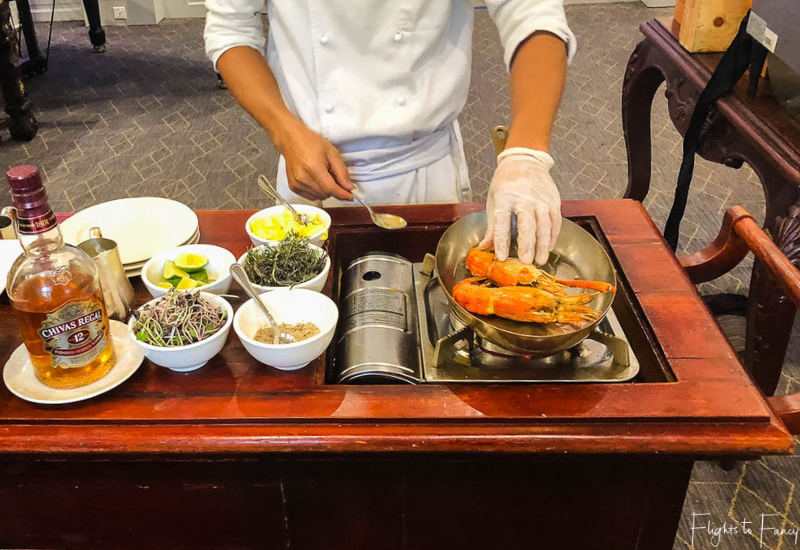 The menu features Khmer cuisine loving prepared to secret recipes from the Cambodian royal family’s kitchens and brunch Phnom Penh style at Raffles Hotel Restaurant Le Royal is truly a next level experience. 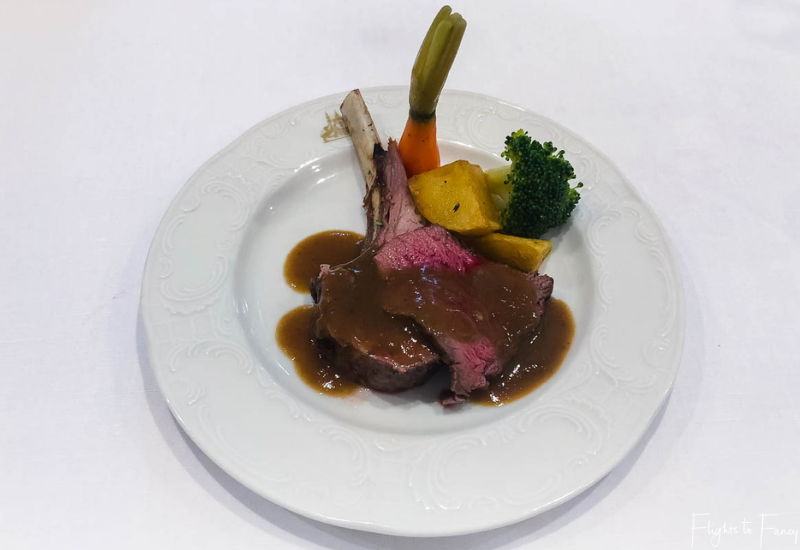 Offered between 12.00pm to 3.00pm every Saturday and Sunday, it’s nothing short of sensational. 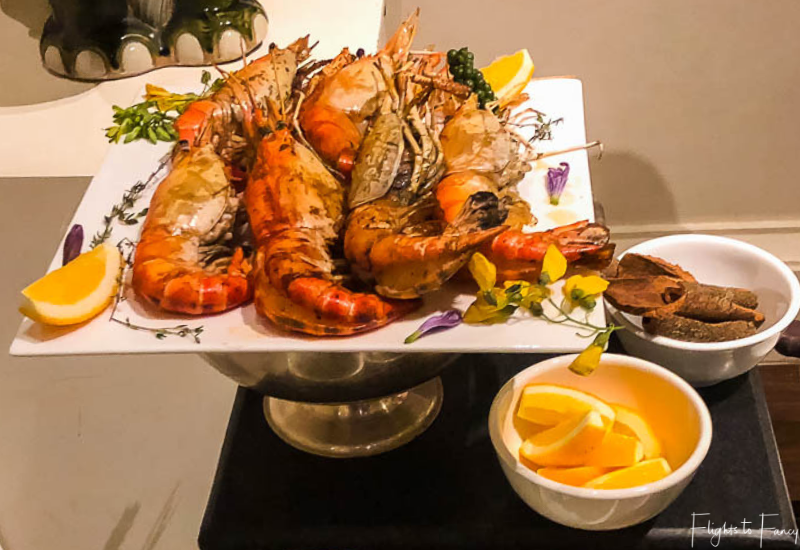 Over the course of three hours, we dined on world-class seafood, the finest imported meats, fresh salads, home-made pastas, decadent desserts and everything in between. 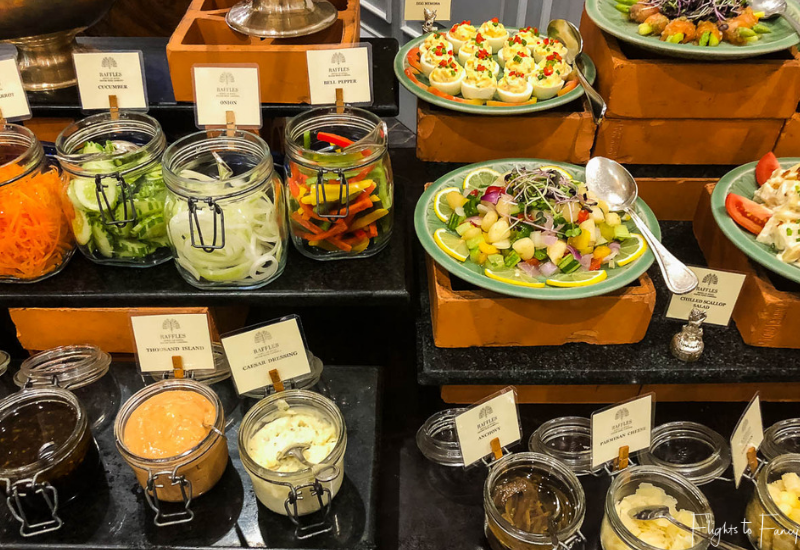 The sheer amount of choice at each buffet station will have you wondering where to start and the French influence is obvious with delicacies such as duck terrine, foie gras and tuna tartare all available, but this extravagant Phnom Penh brunch does not stop at the buffet. 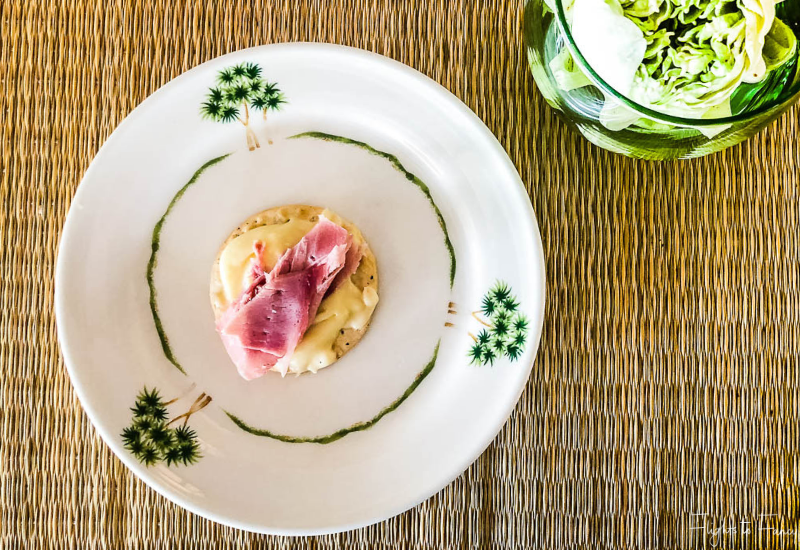 On arrival each guest is presented with an á la carte menu to enhance their dining experience. 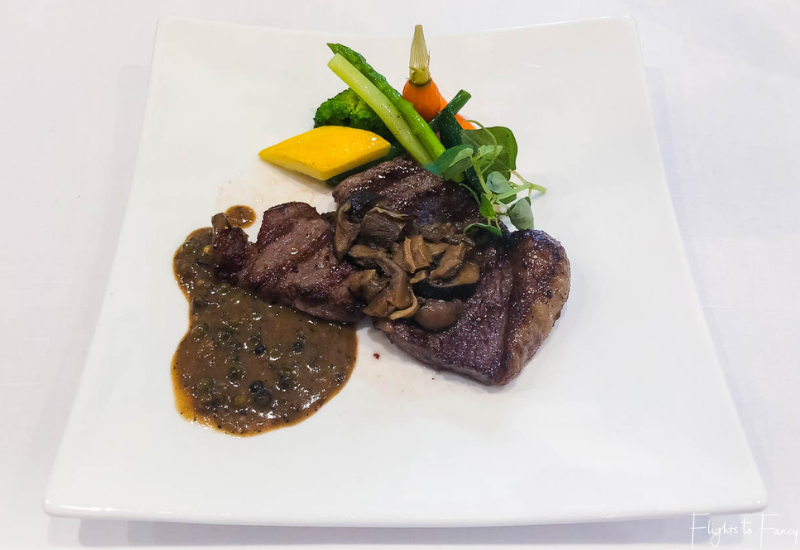 I may be a little biased but the Australian Wagyu in Black Kampot Pepper Sauce was sensational. 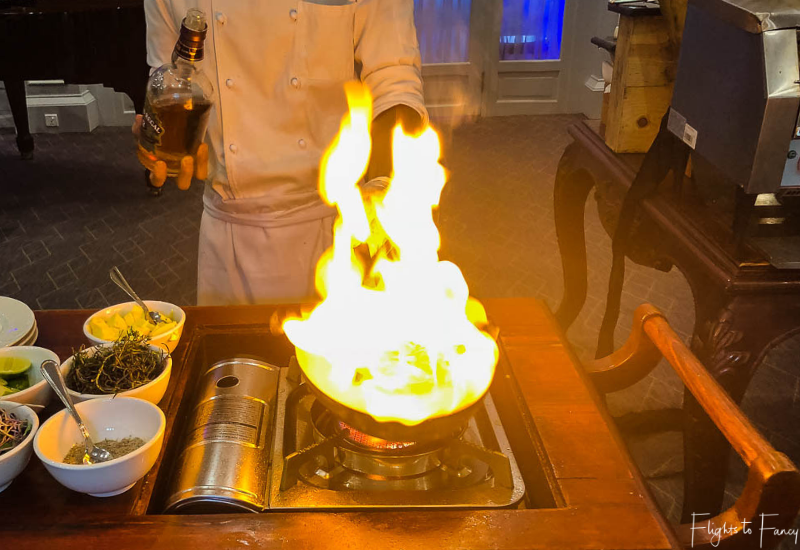 Every memorable meal includes a little theatre and the showmanship of the white-clad chefs as they expertly flambéed scallops and lobsters for The Hubs right beside our table was a highlight. 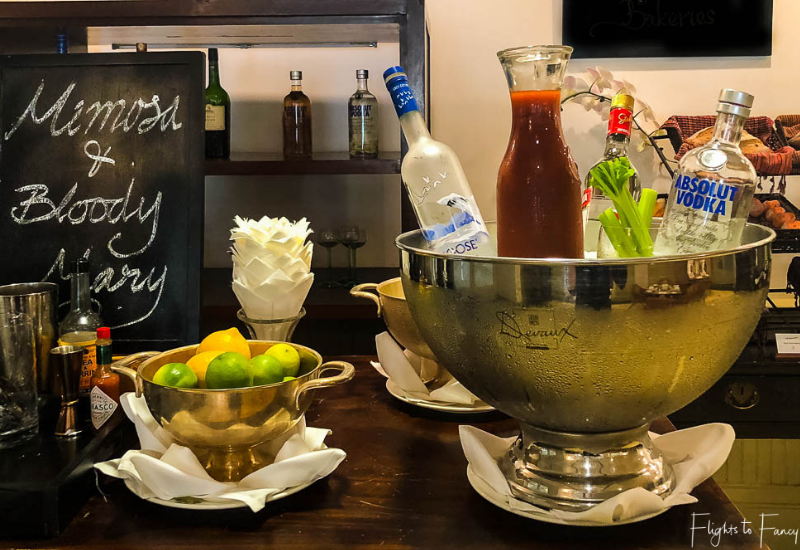 A meal this special deserves a special drop so brunch at Raffles Phnom Penh comes with unlimited Champagne, craft beer and bloody marys. 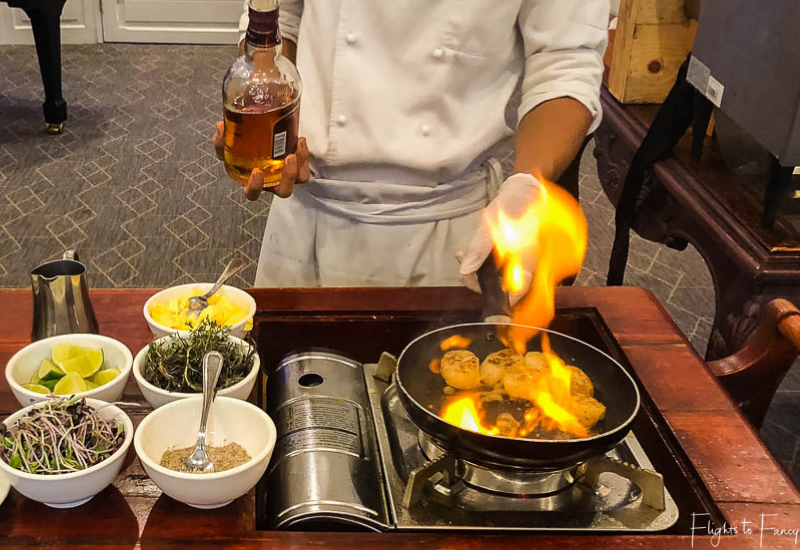 This is truly the best way to do brunch Phnom Penh style. 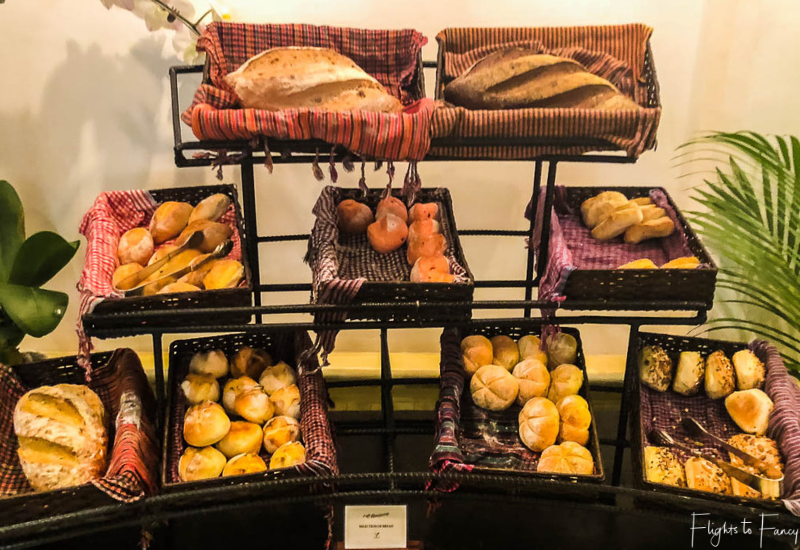 The best breakfast in Phnom Penh is served at Raffles Hotel Le Royal’s very own Cafe Monivong. 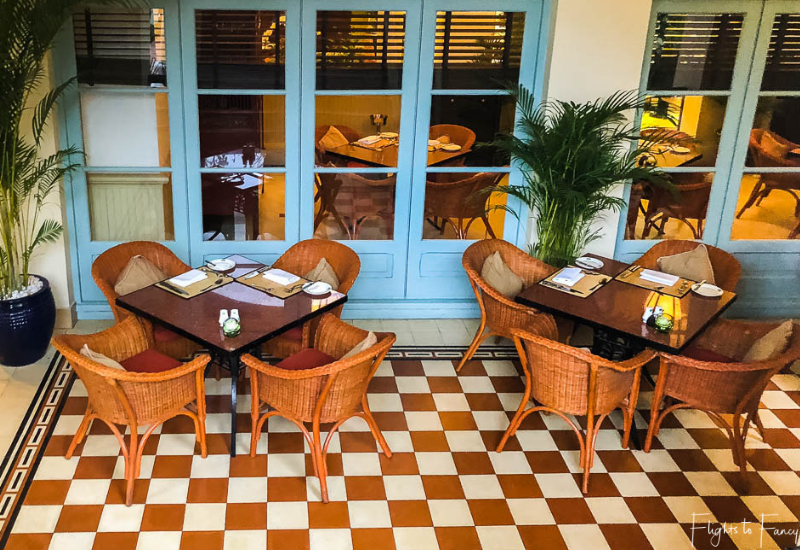 More casual than Restaurant Le Royal, Cafe Monivong serves breakfast between 6am – 10am daily to hungry guests. 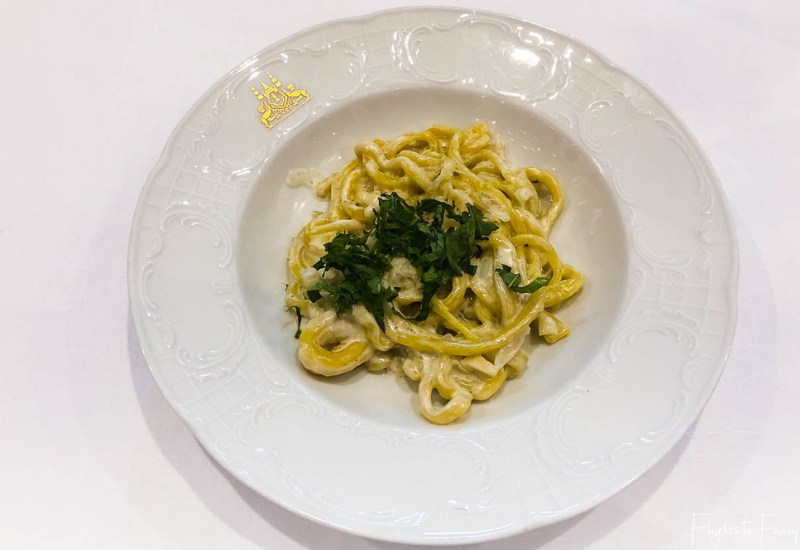 While diners might arrive hungry, they most certainly don’t leave that way. 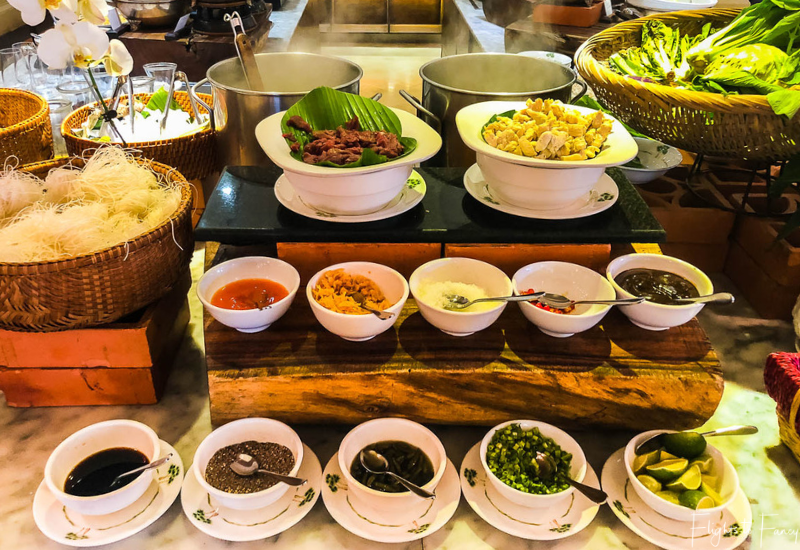 Cafe Monivong features multiple buffet stations spread around the spacious open plan interior. 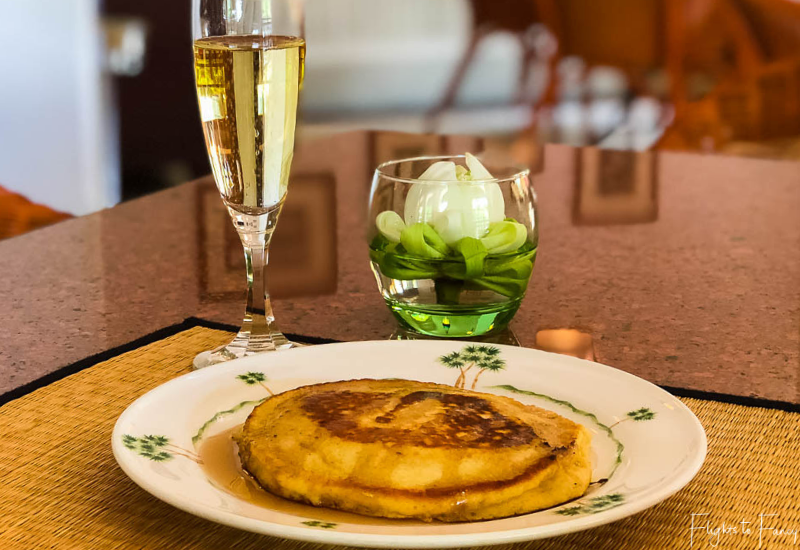 The egg station, pancake grill and noodle bar are all manned by skilled chefs who cook your selections to order. The Hubs always starts with scrambled eggs and bacon with all the trimmings. I pinched a few dauphinoise potatoes from his plate and they were fantastic. 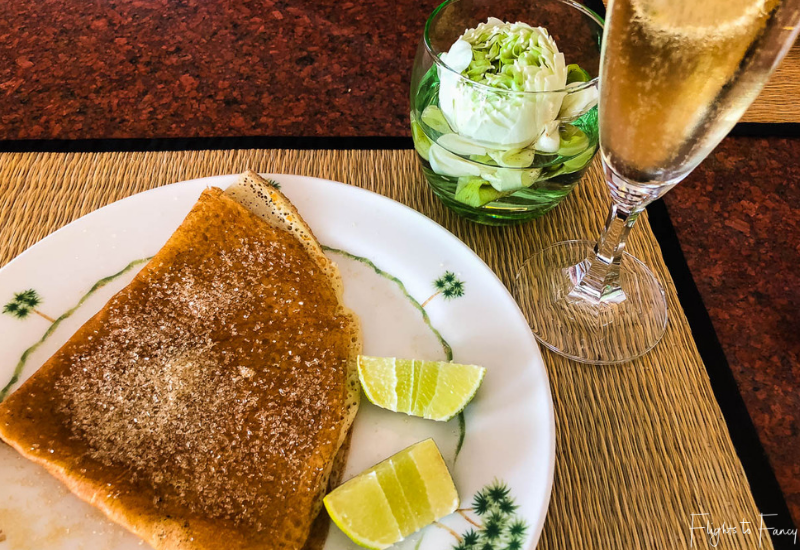 Crepes have always been a firm favourite of mine, so I gravitated towards the grill. I like mine with lemon and sugar, but as I couldn’t find any lemons I figured lime was a perfectly acceptable alternative. The noodle bar was The Hubs’ favourite station. 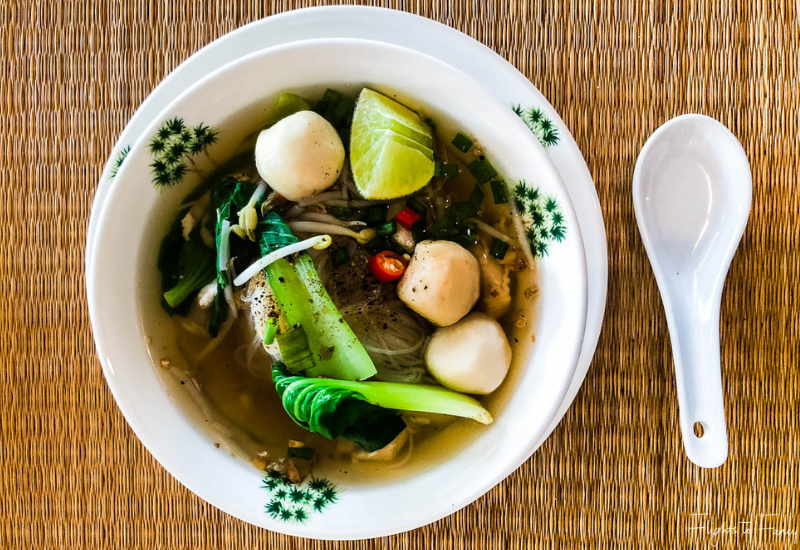 The steaming bowl he brought back to the table was a complex mix of flavorsome broth, chicken, vermicelli, bok choi, bean sprouts, spring onions, chilli, pepper, soy sauce and lime. 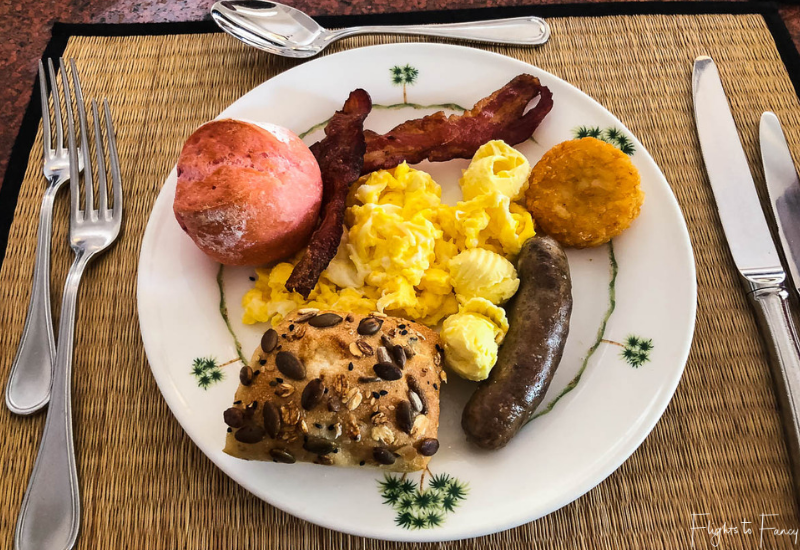 I ventured out of my comfort zone a little and tried a few things I wouldn’t ordinarily deem as ‘breakfast foods’. Like cheese and crackers. 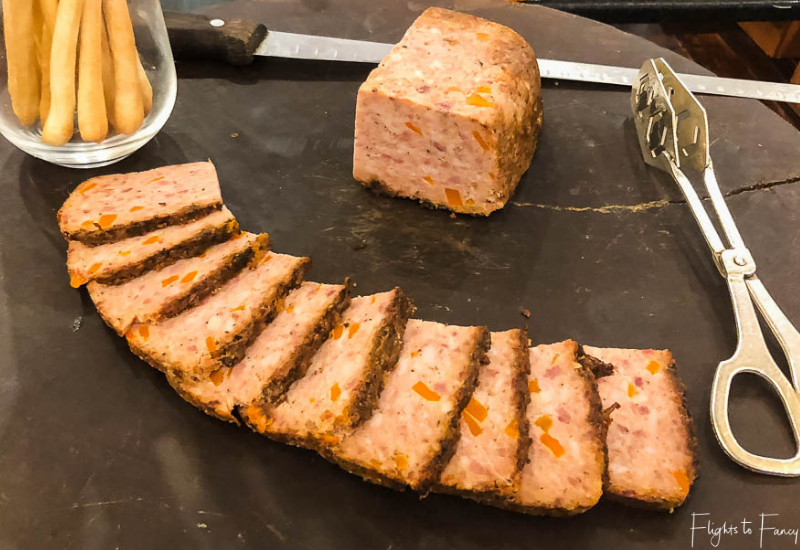 The sliced to order ham I added to the mix was sensational. I went back more than once. 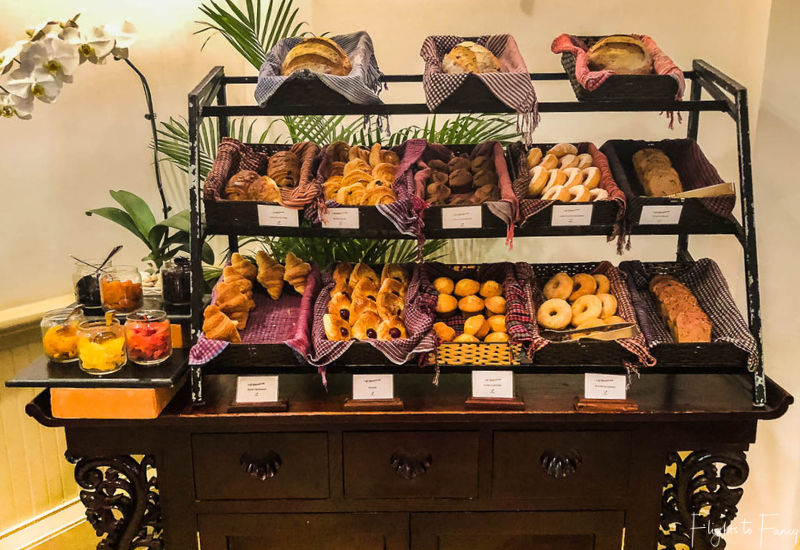 Asian food lovers are well taken care of with a dedicated station serving all the classics and the bakery selection was outstanding. Try the beetroot rolls with lashings of butter and maybe some pure honey straight from the hive. 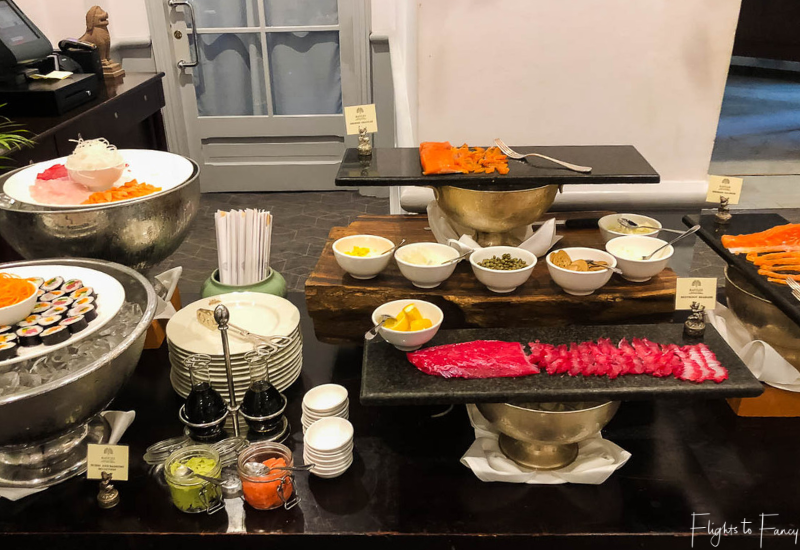 I’ve been to many a breakfast buffet on my travels, but the buffet breakfast in Phnom Penh Raffles is the only one where I have ever seen Champagne on ice for guests to enjoy. And it’s the good stuff too! Despite the early hour, I couldn’t resist indulging in a glass or two. 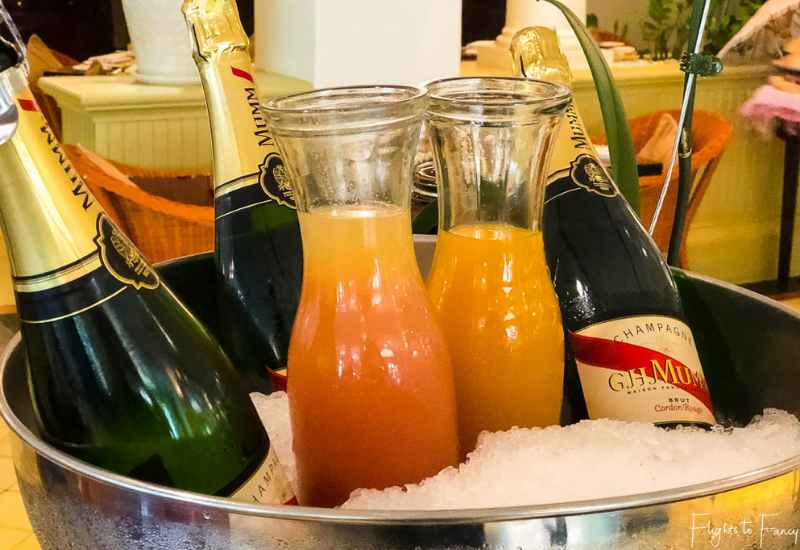 If Champagne is not to your liking, you may prefer a vodka or bloody mary. Hey, it’s 5pm somewhere right? 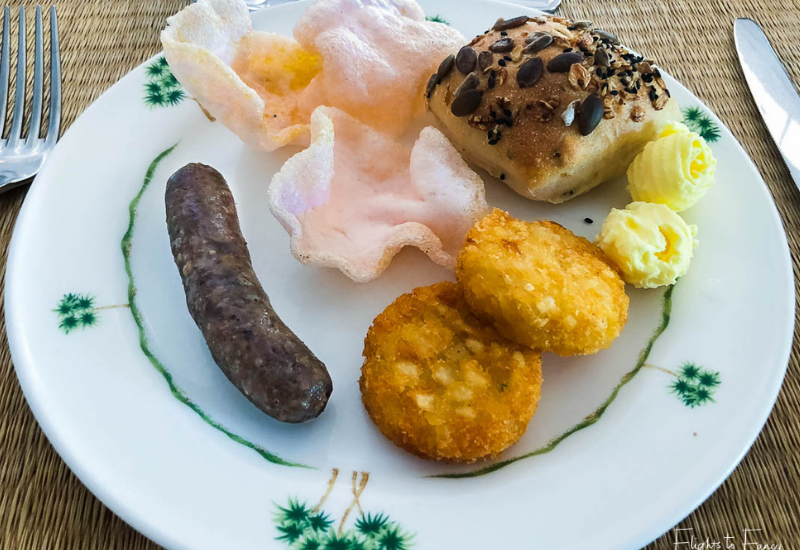 I’m totally convinced I found the best breakfast in Phnom Penh at Raffles Hotel Le Royal. 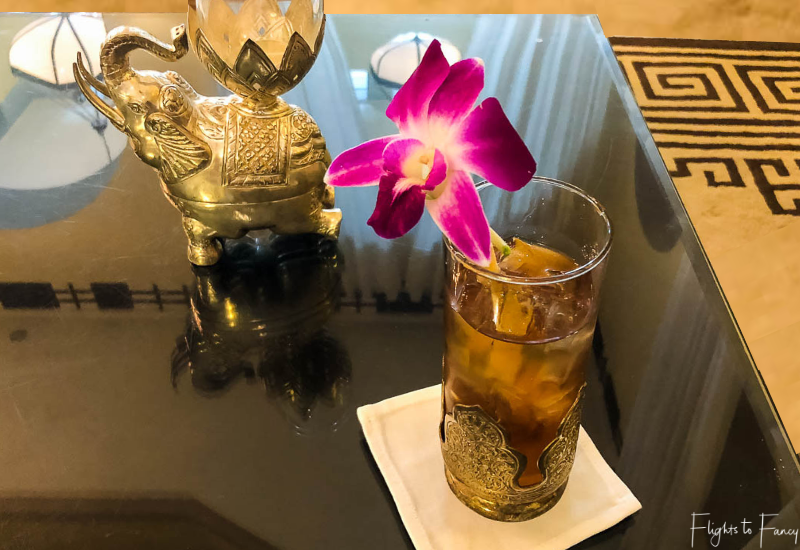 Cocktails are synonymous with my travels and it would have been remiss of me to visit Raffles Hotel Le royal without stopping by The Elephant Bar and sampling a world-famous Raffles Singapore Sling. 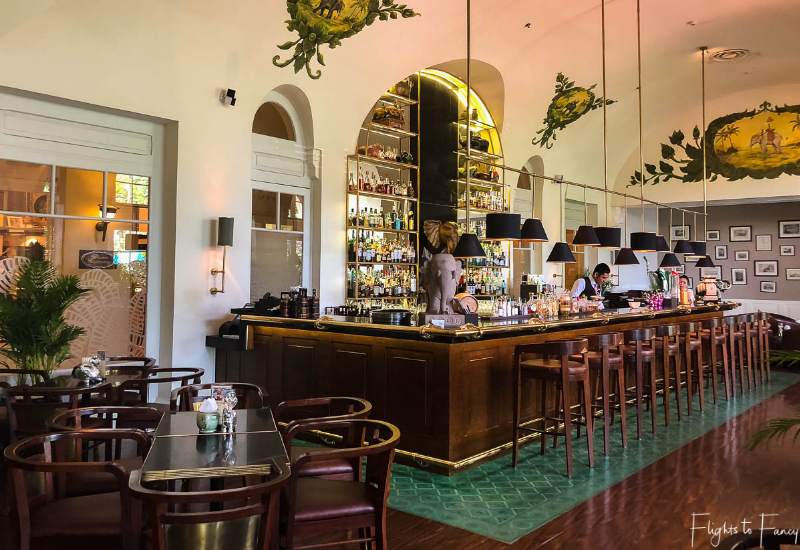 Raffles Hotels serve their signature cocktail which was created over a century ago at all 13 Raffles properties across the globe. 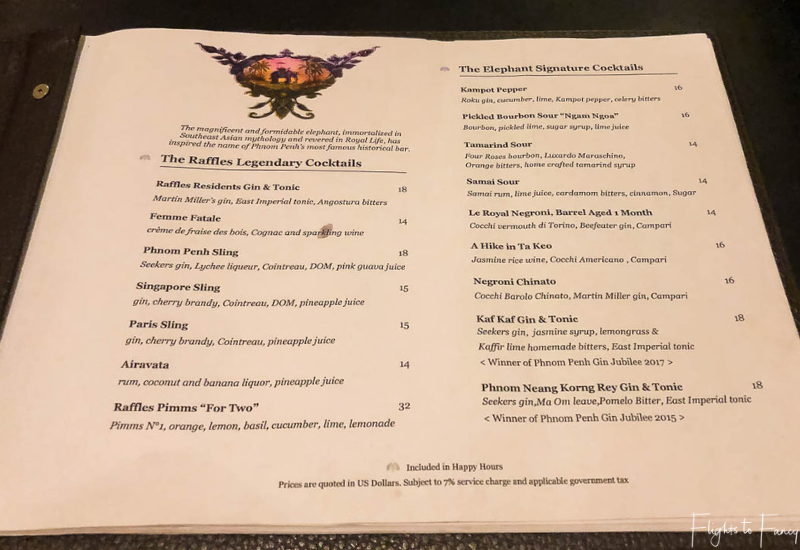 The main ingredients in a Singapore Sling are gin, cherry liqueur, Dom Benedictine, Contreau, Grenadine, bitters, pineapple juice and fresh lime. It’s a superbly refreshing combination that is easy to imbibe but packs a punch. 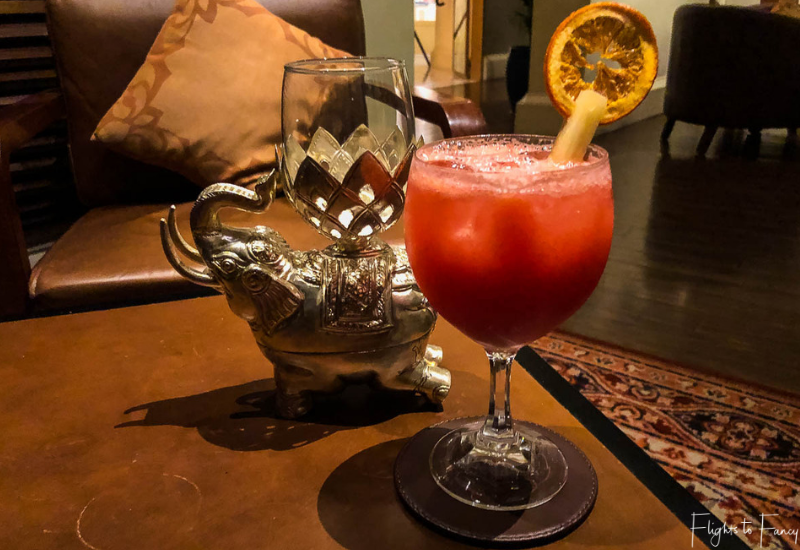 I’m all about luxury for less and the best way to save a few pennies on your Raffles Singapore Sling is to visit the Elephant Bar during happy hour (4pm – 9pm) when they are half price. 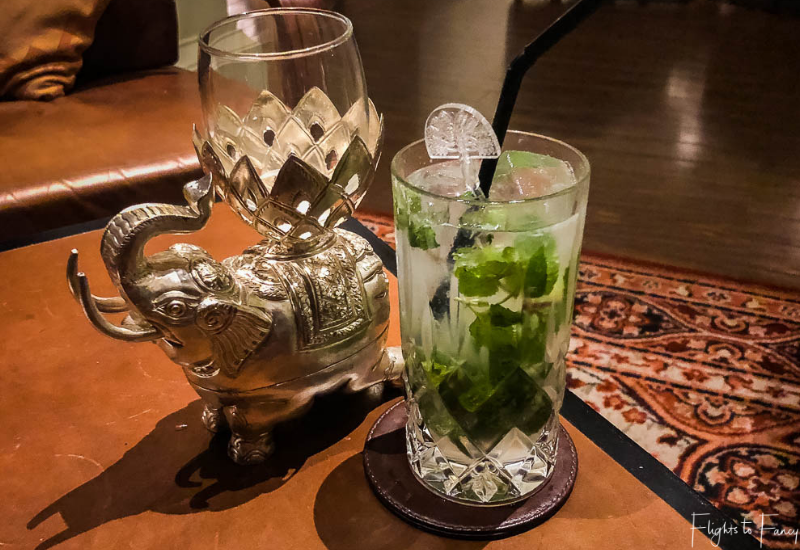 Of course The Elephant Bar serves more than just the world-renowned Raffles Singapore Sling and as we settled into the oversized leather lounges in our booth I studied the extensive cocktail menu intently. I’m told Jacqueline Kennedy favoured the Femme Fatale. 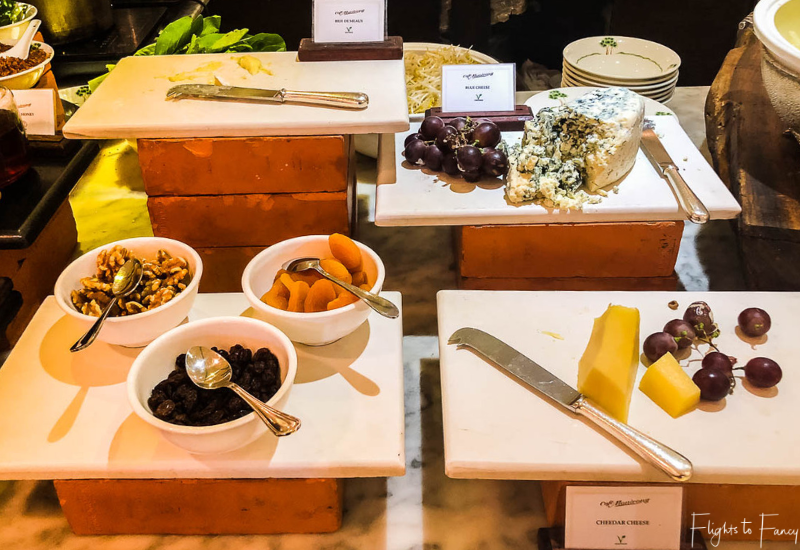 Table service is swift and within moments of sitting down a generous selection of complimentary bar snacks appeared. 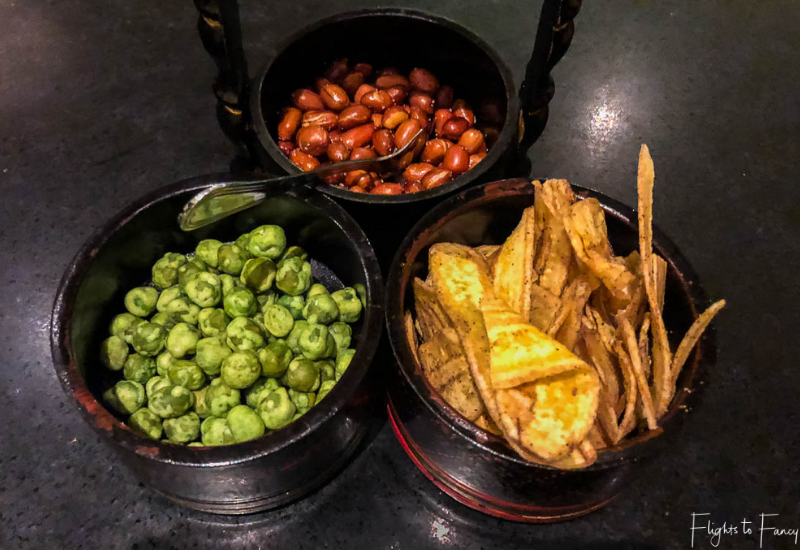 Watch out for the wasabi peas, they have some serious heat! The Hubs stuck to beer as I alternated between Phnom Penh Slings and Blossoms. Both were delicious. If hunger strikes there is no need to leave The Elephant Bar. 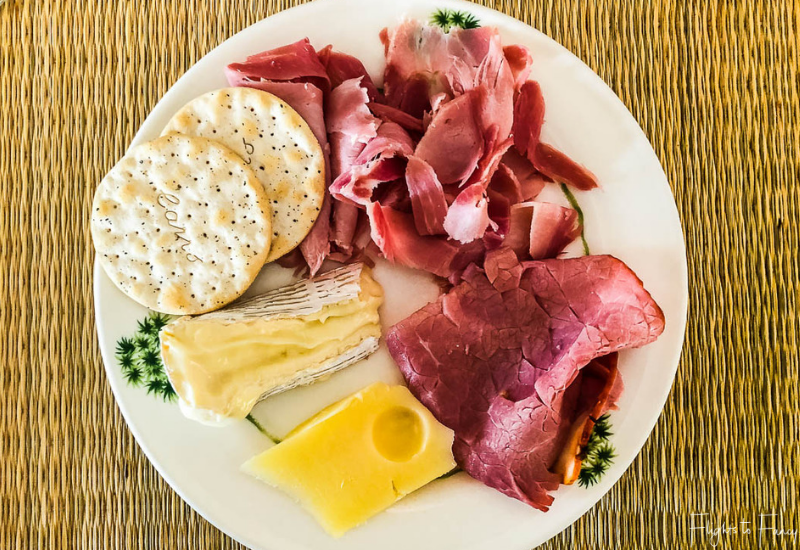 Try the legendary afternoon tea, a light lunch or a more substantial dinner. 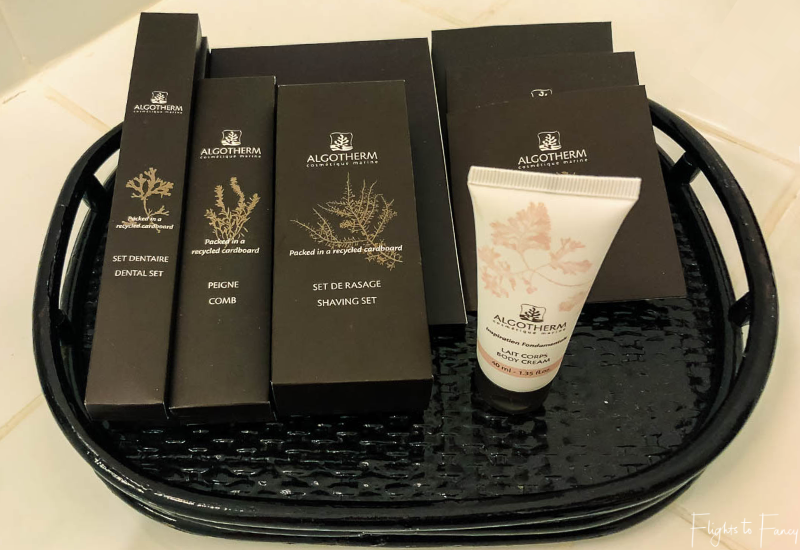 On the last day of our stay at Raffles Hotel Le Royal Phnom Penh I decided to treat myself to a 90 minute facial at The Spa. I absolutely adore facials, but my hectic schedule means I don’t get to indulge as often as I would like. Being away from the day-to-day makes it a little easier to squeeze in some me time and I took full advantage. 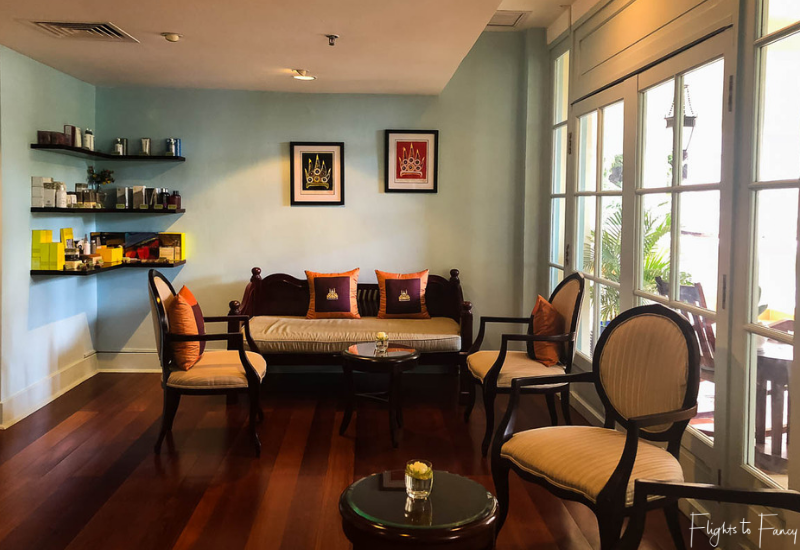 The Spa at Raffles Hotel Le Royal is located on the first floor above Cafe Monivong. 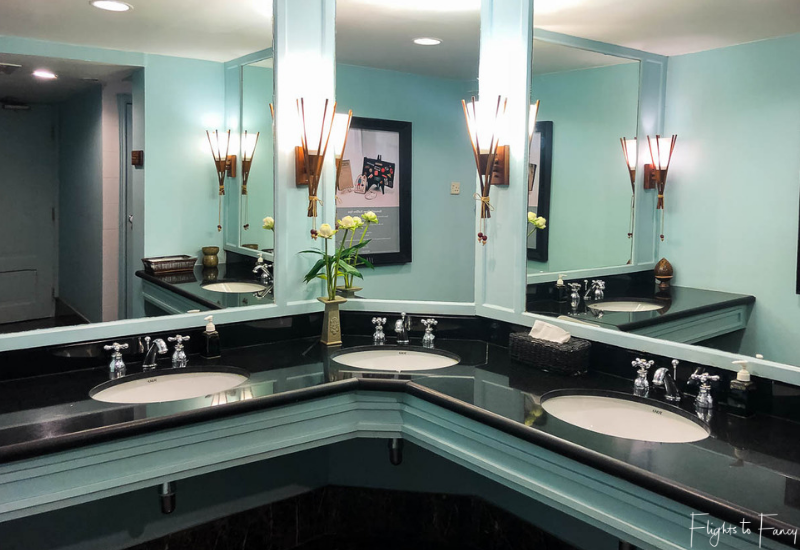 Beyond the comfortable reception area, the ladies change room offers more than just a place to don your robe. 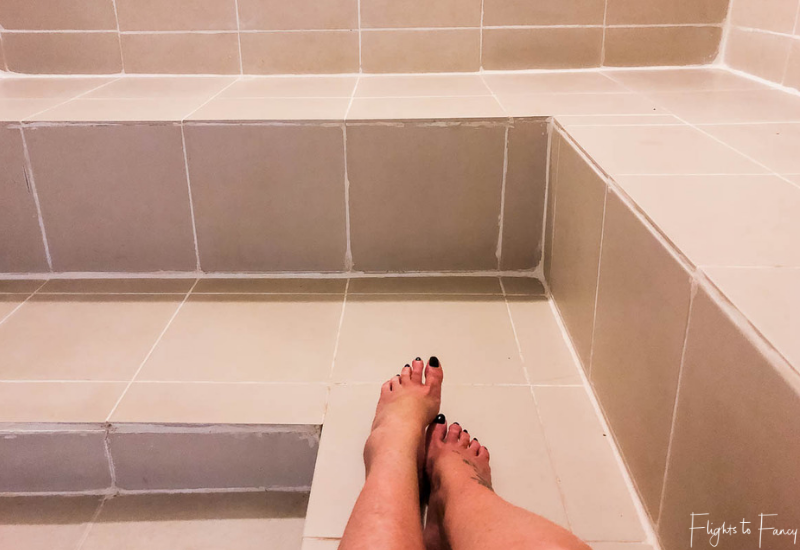 In additional to the expected showers, toilets and lockers, the inviting duck-egg blue space features a steam room, a plunge pool and a sauna. 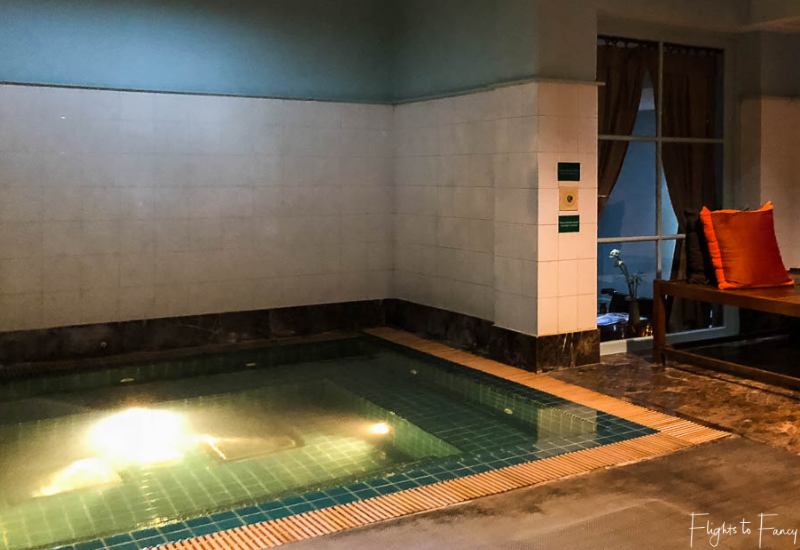 I tested both the sauna and the steam room prior to my treatment. 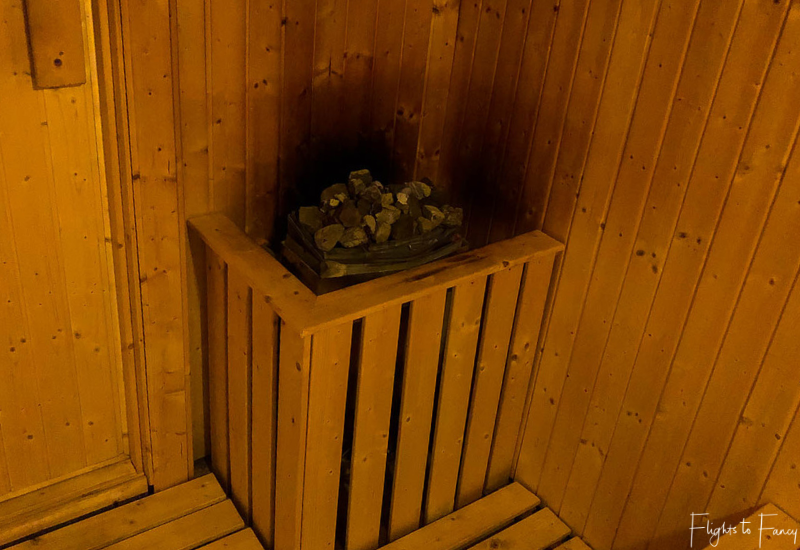 The sauna was set to a whopping 92c so spend your time inside sparingly. It wasn’t long before Thary my therapist appeared and led me to my treatment room. My facial started with an orange essential oil massage and moved into a deep cleanse and exfoliation. The heady scent of essential oils that filled the room was bliss. Thary completed a hand and foot massage while the divine two layer collagen infused mask worked its magic. 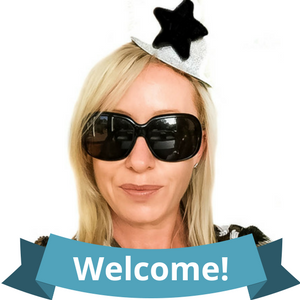 As I stepped out of The Spa I felt like a new woman and vowed to do this more often. 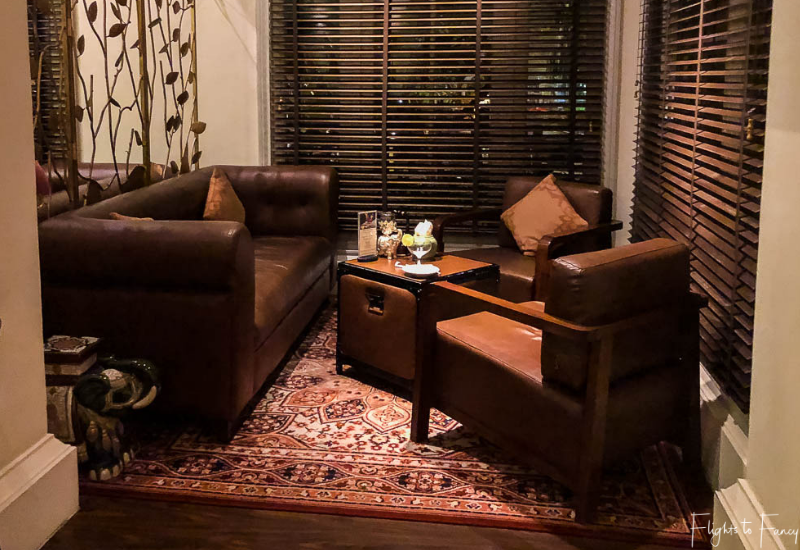 Being located in the best area to stay in Phnom Penh puts Raffles Hotel Le Royal within easy reach of Phnom Penh’s best attractions. Tuks tuks are one of the easiest ways to get around Phnom Penh and while there are no shortage of drivers looking for work on the street, I recommend using Grab. 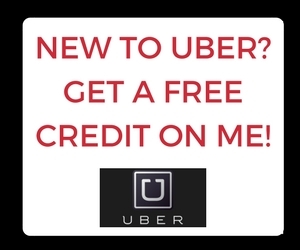 The waiting time is short and the fares are much lower than what we were quoted on the street. We organised a Metfone Cambodia local SIM card so we were always able to order a driver on the go. Wat Phnom is one of Phnom Penh’s most significant temples and is less than a 10 minute walk from Raffles Hotel Le Royal. The Tonle Sap and Mekong rivers merge in the heart of Phnom Penh and a sunset cruise on the mighty Mekong River is a great way to enjoy the sights. While you are in the area stop by the incredibly ornate Royal Palace. You never know who you might bump into. 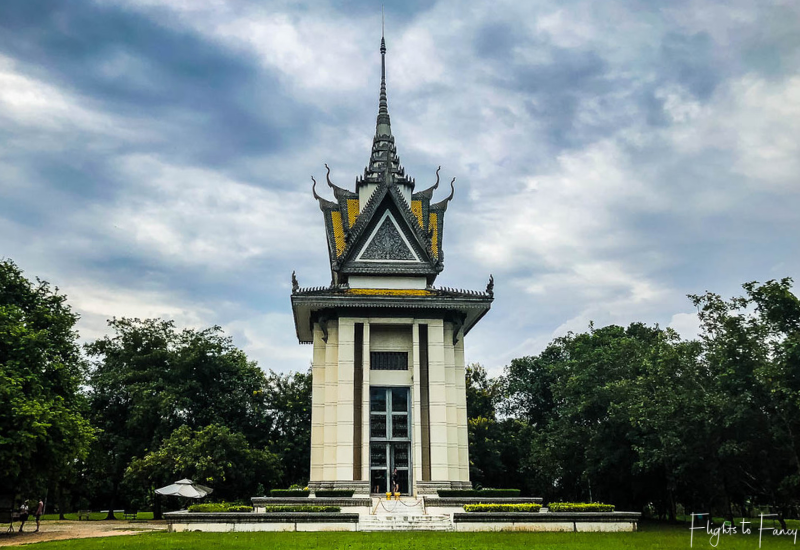 Venture a little further afield to Choeung Ek (The Killing Fields) and Tuol Sleng Genocide Museum (S21) for a chilling insight into Phnom Penh’s brutal past. 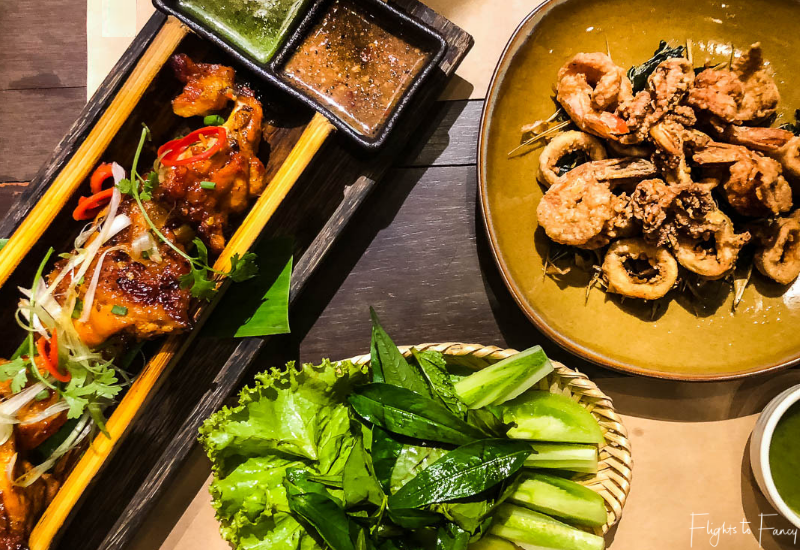 Phnom Penh is a foodie’s paradise and nearby Labaab offers Khmer cuisine in a relaxed setting. If middle eastern is more to your style try Casablanca. 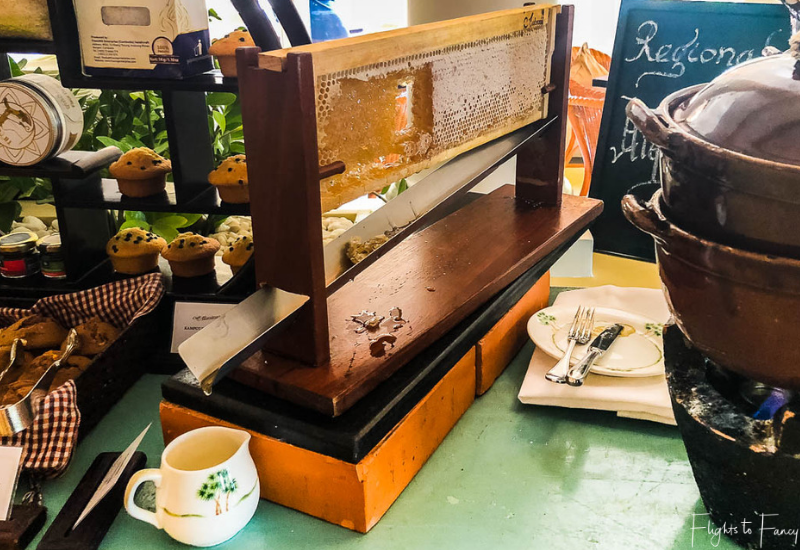 Raffles Hotel Le Royal puts you in the prime position to enjoy everything Phnom Penh has to offer so get out and experience it all. Raffles Hotel Le Royal’s enviable position in the best area to stay in Phnom Penh was a critical factor in choosing our home away from home. 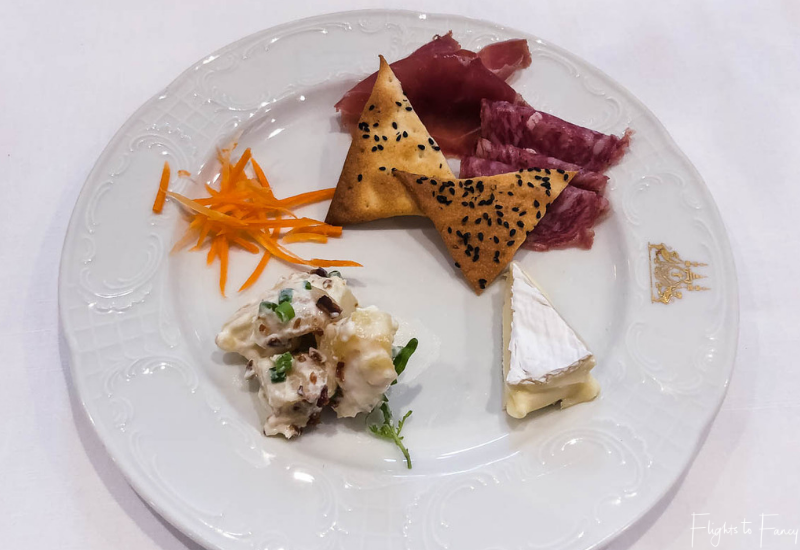 While location might have enticed us through the door, the exceptional service, exquisite fine dining, stunning grounds and extensive facilities validated our choice. 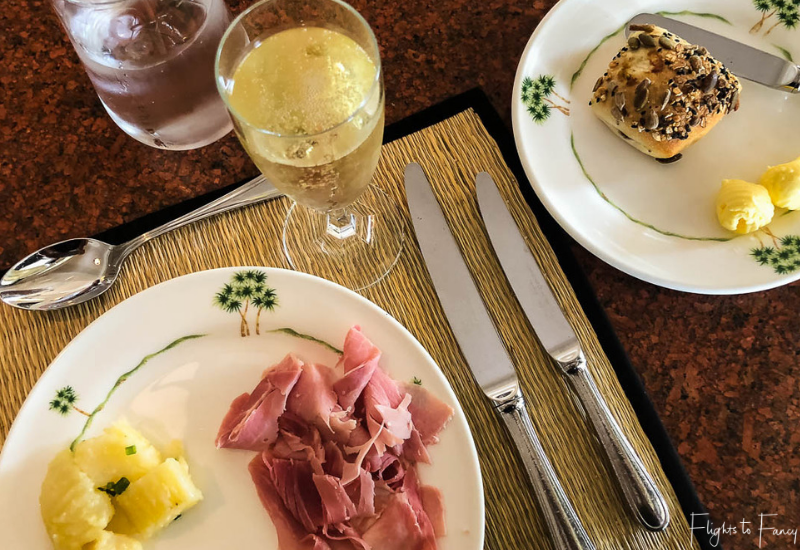 We truly felt like royalty during our stay and it was torture leaving to catch our Qatar Airways business class flight to Ho Chi Minh City. It was even worse catching our connecting Jetstar International flight back to Sydney. 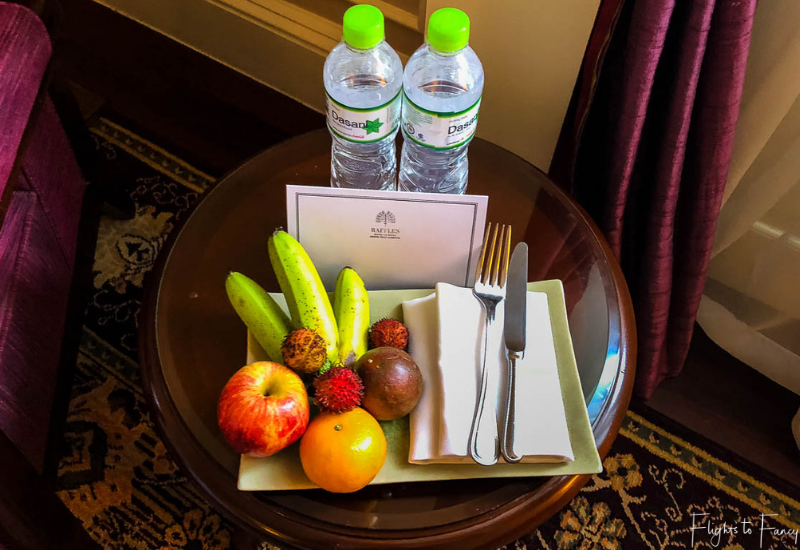 Do yourself a favour and put Raffles Hotel Le Royal at the very top of your list when considering where to stay in Phnom Penh. 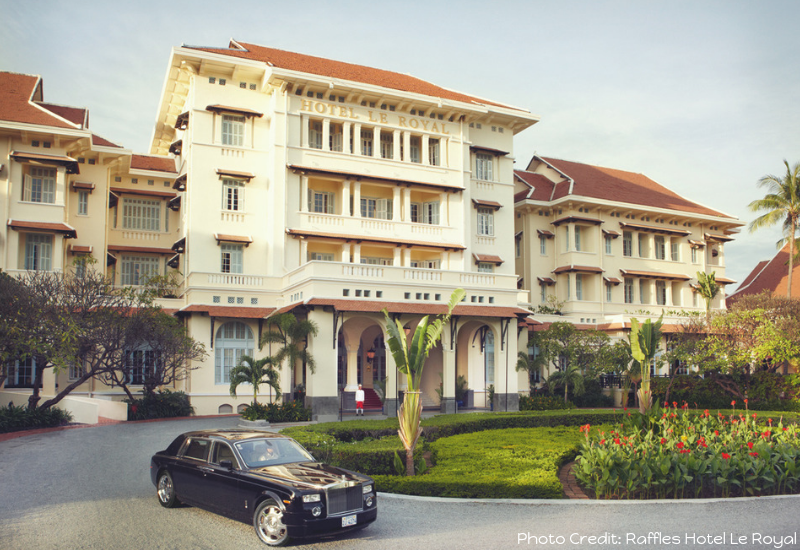 Disclosure Statement: I stayed at Raffles Hotel Le Royal Phnom Penh as a guest. The information in this article is based on my own personal experiences and has not been influenced in any way by the brand(s) featured. This post may contain affiliate links which if clicked may earn me a small commission on purchases at no extra cost to you. 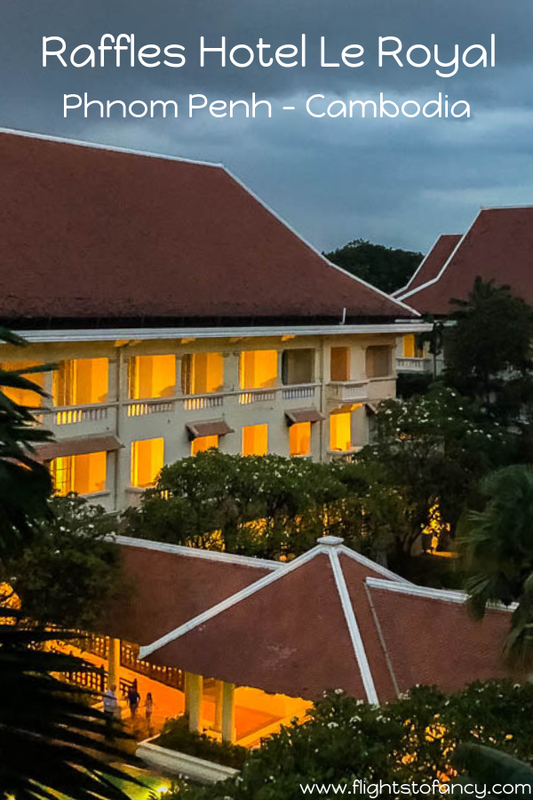 The Raffles Le Royal Phnom Pehn has absolutely redefined luxury. From the architecture, decor, food to spa, I loved everything described by you. 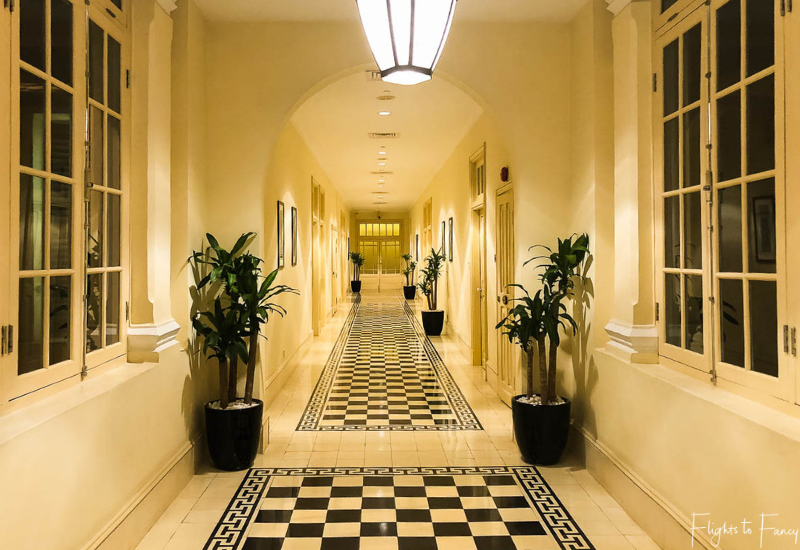 It would be a treat to stay at this iconic hotel with such enriching history. You have described very experience so beautifully that I can’t wait to indulge in the luxury myself whenever I visit there. Thanks for the vivid description. I loved everything too Parnashree. I hope you get to visit soon. I enjoy reading personal reviews about luxury hotels such as yours. Raffles is in many parts of the world like Manila where I used to live. And although I have not personally stayed there I’m absolutely sure that it’s extra gorgeous like Raffles Hotel Le Royal Phnom Penh. The spa here is mostly what I’d love to try, so relaxing and inviting! You sure did enjoy that one! I love luxury stay and Raffles hotels are always in my choice. 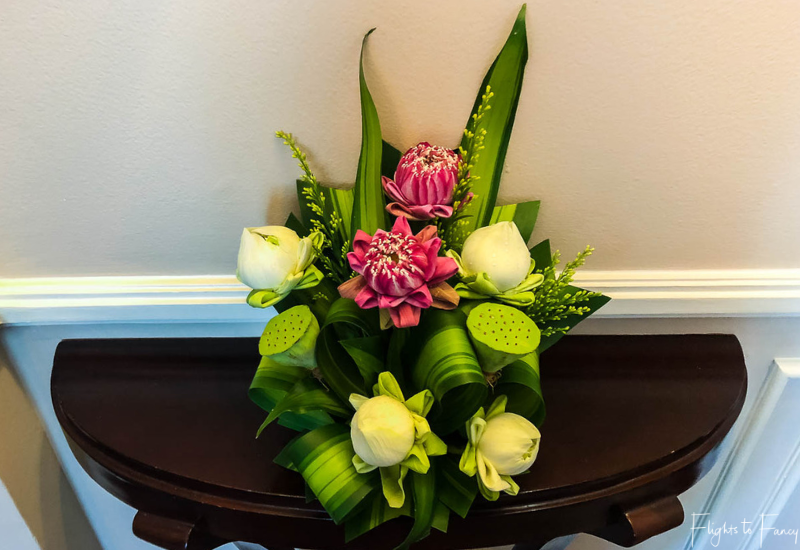 It was lovely to see how beautiful and bespoke Raffles Phnom Penh is. 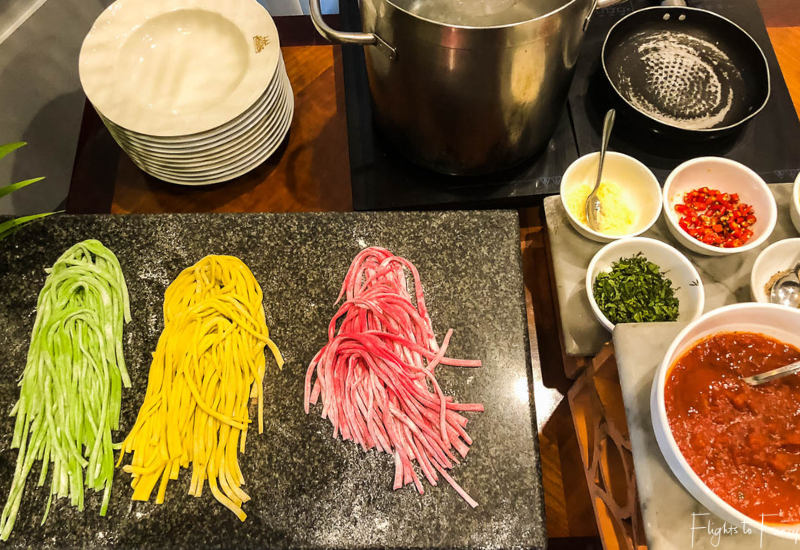 Which part of your whole stay is your best favorite? Most definitely the brunch Blair. It was sublime! Talk about luxury! I love a good hotel that boasts such amenities. I particularly am a sucker for anything nostalgic when it comes to Hollywood and notables celebrities of the past. I would definitely have looked into which room Charlie Chaplin stayed in as that would be such a cool memory. 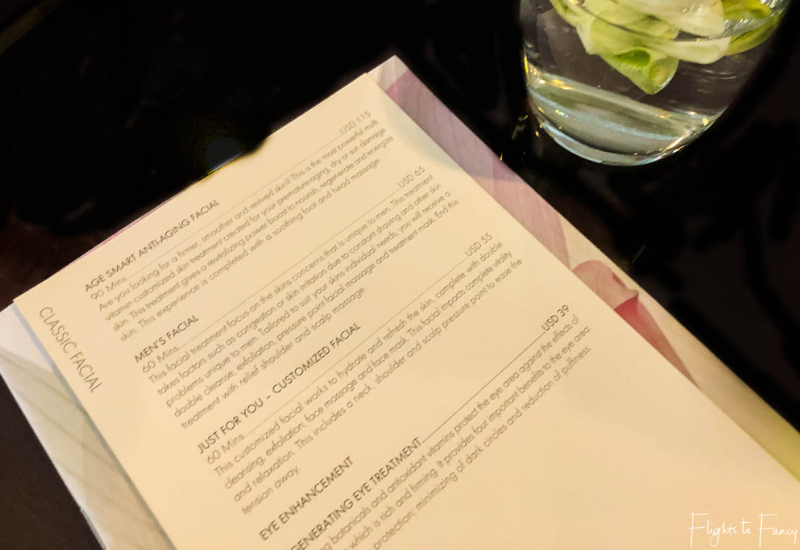 Neat to see they kept the lipstick on the glass from Jacqui O. I love a good spa! As the latest trend is the customized facials, it is great to see them offered here along with a state of the art sauna. The rooms looks fabulous and i’m glad that it keeps the light out, especially for jet-lagged clients. 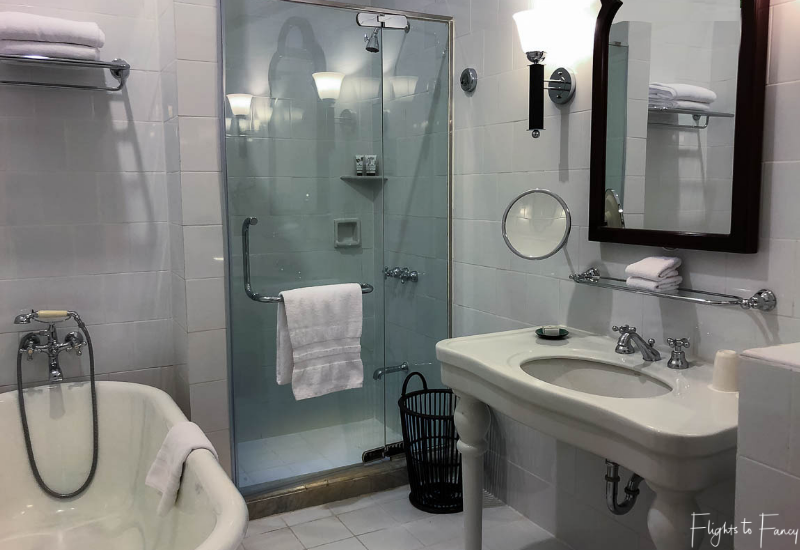 Clawfoot tubs are my fave and the one in the washroom looked chic and perfect for a soak after a day of sightseeing. Man that buffet looked amazing! I too would enjoy some champagne. 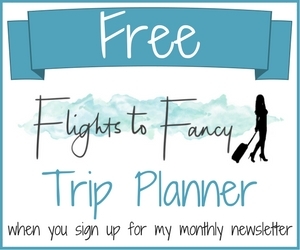 If I get to Cambodia, i’m stopping here! We loved every second of our stay Janine. I hope we get to visit again in the not too distant future! I’ve not stayed at the Raffles chain, but it looks very luxurious. That brunch is to die for, I don’t know where I’d start! I love the old world charm here, it really feels like stepping back in time. I had no idea that Raffles hotel brand had properties other than the original Singpore one! Mind blown already. 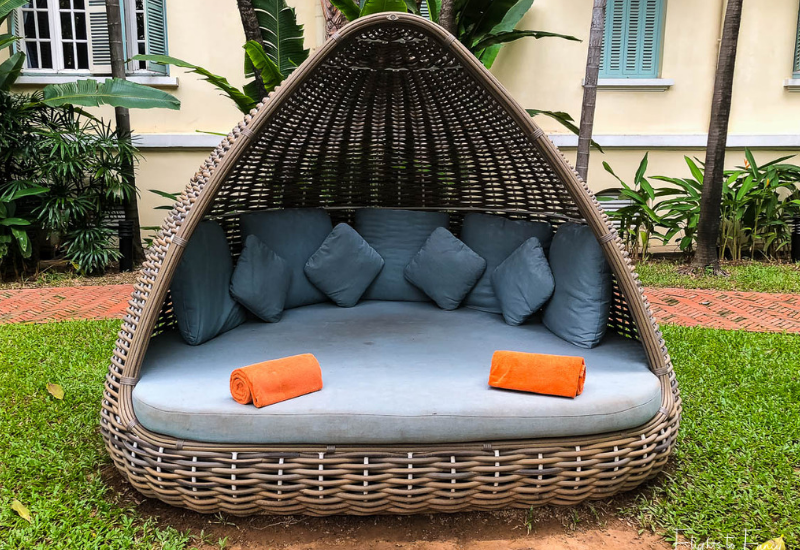 This one in Phnom Penh looks charming and luxurious, no doubt it has to be for that royal connection. I like that Raffles refurbished and took the grand dame back to former glory. 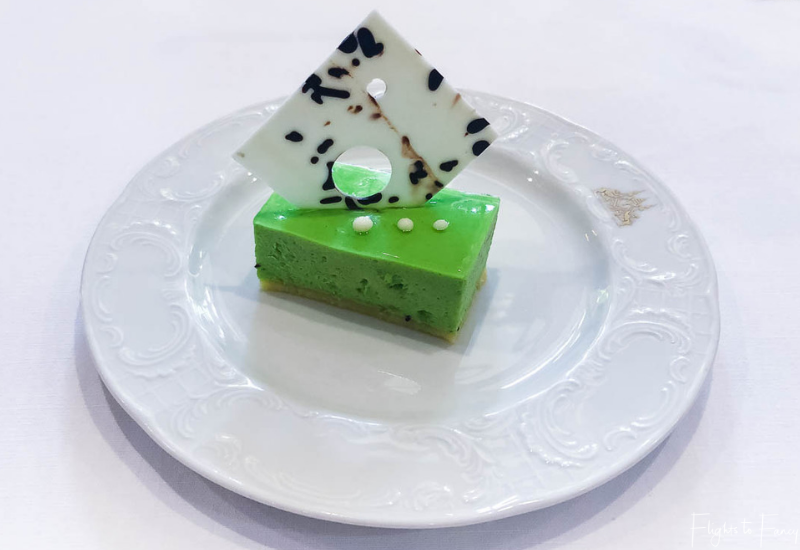 It sounds as though the food offering is excellent, and spa treatments also. 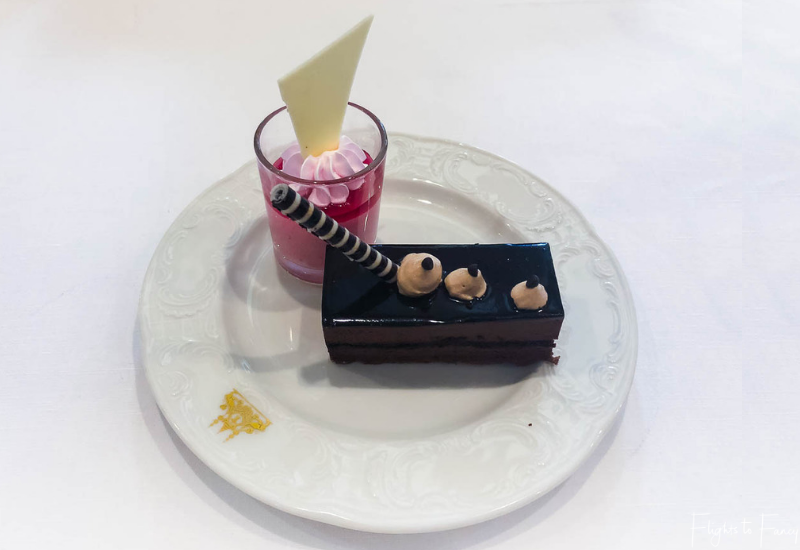 I’ve stayed at the Raffles in Singapore and I loved my stay there. I had no idea there was one Phnom Penh, that is very interesting to know. I think it’s time to plan a trip to Cambodia. Thanks for posting this. Sounds like a plan Sarah. 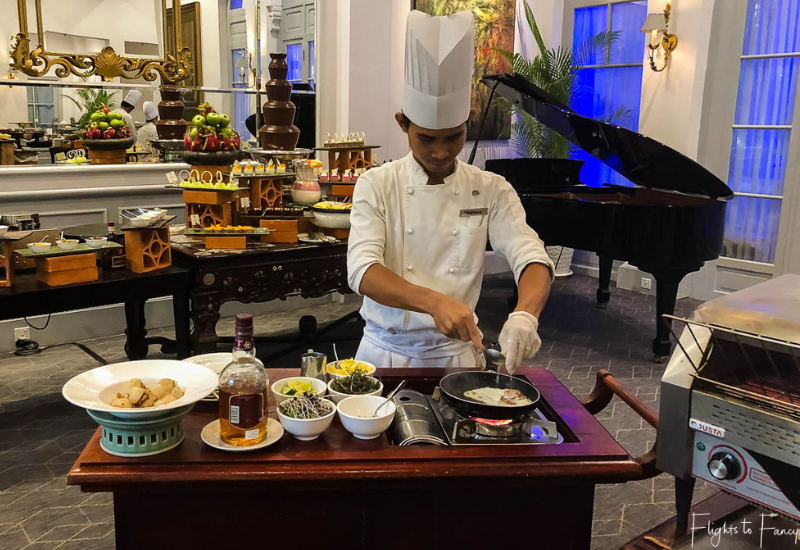 It’s been a while since I visited Raffles Singapore, but Hotel Raffles Le Royal Phnom Penh is every bit as fabulous as I remember Singapore being. 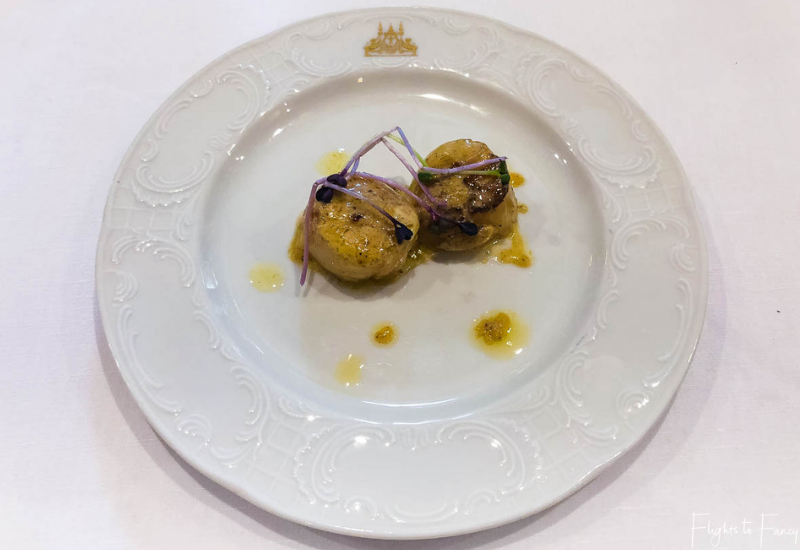 The Raffles Le Royal Phnom Pehn has certainly earned the royal seal of approval! I love great service and staff – it makes the stay so much more enjoyable (as do the blackout curtains). 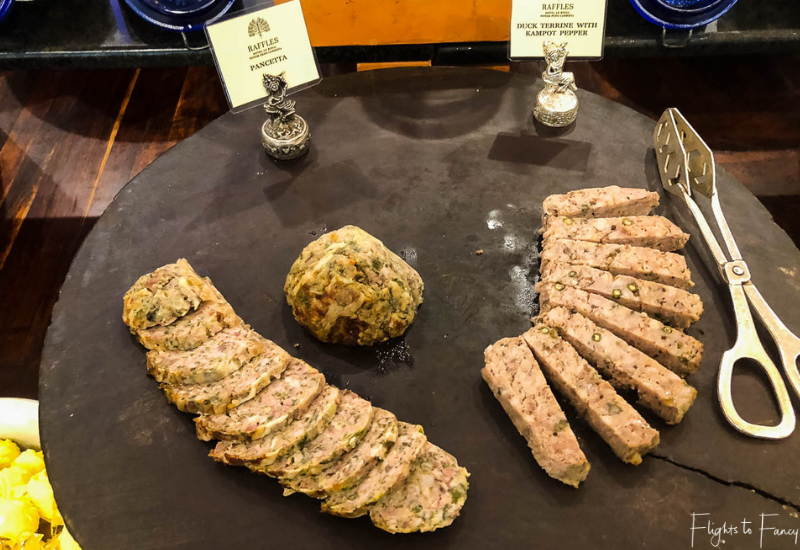 That brunch is so fancy – I’ve never had foie gras as an option at the buffet. 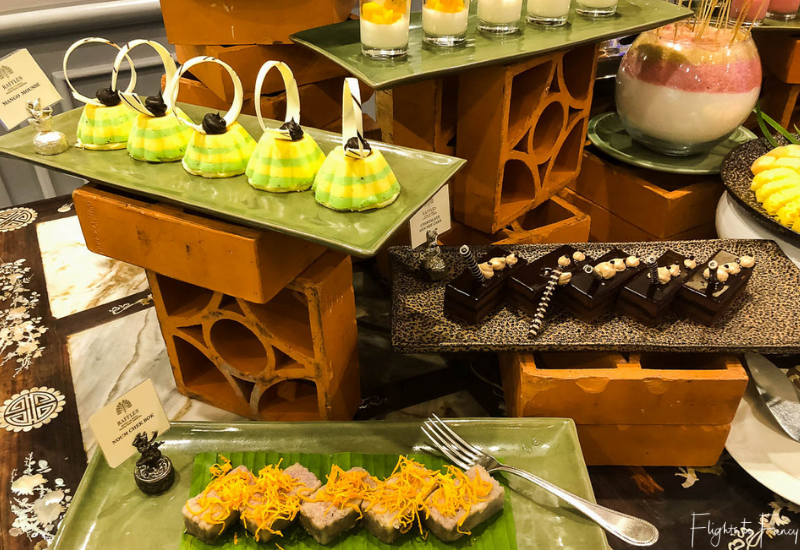 But I see that the luxury is carried through to the breakfast buffet and even to the bar while enjoying a Singapore Sling.